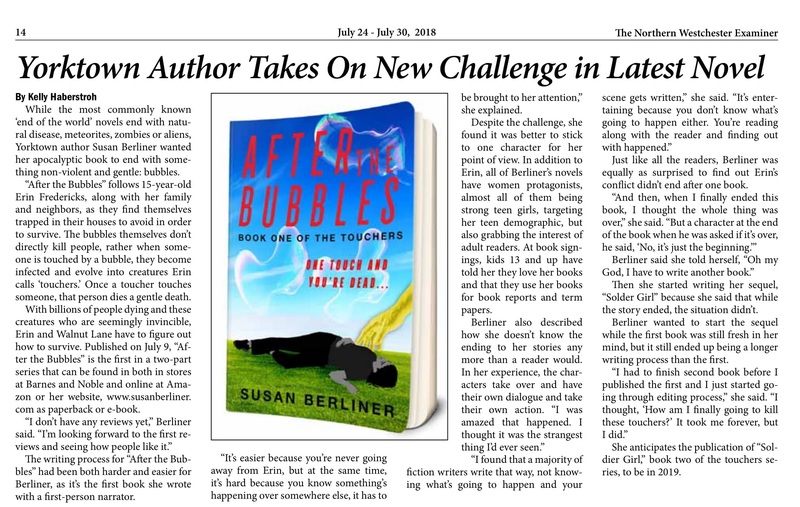 The events below relate to Susan Berliner, author of the supernatural thrillers "DUST,"
and Other Weird Tales," and the new dystopian novel, "After the Bubbles." 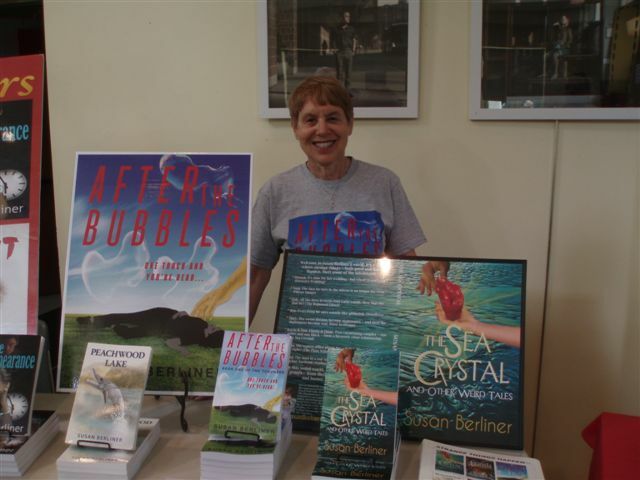 signed copies of my doomsday thriller, After the Bubbles. 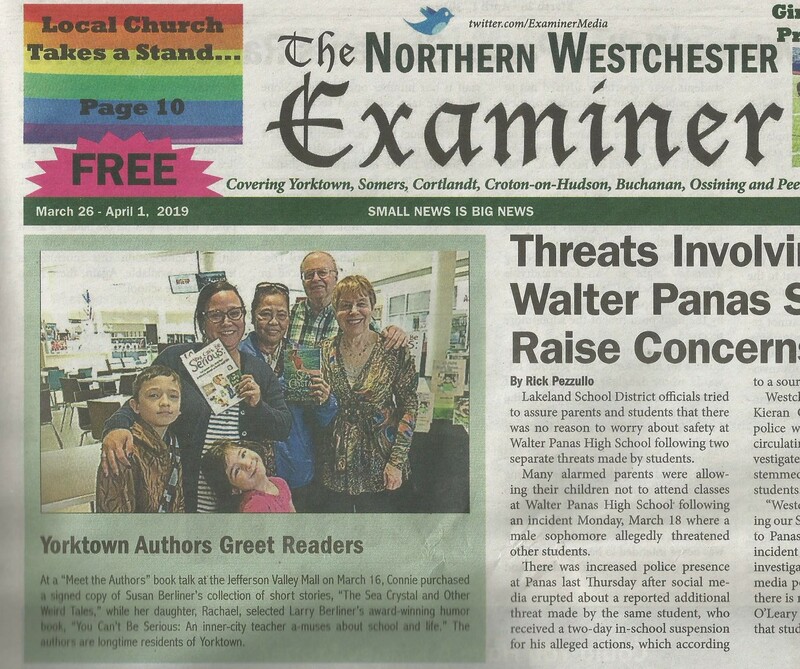 appeared on the front page of the Northern Westchester Examiner. 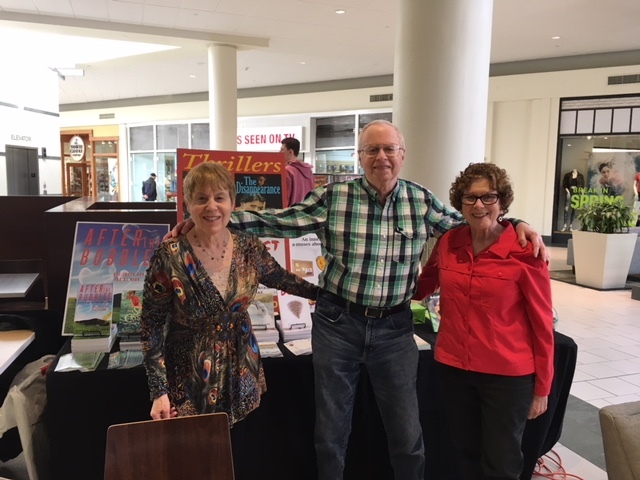 Jefferson Valley Mall in Yorktown, NY with Larry Berliner and Linda Griffin. We talked about our books, our publishing journeys, and read excerpts of our work. providing us with comfy furniture and a sound system. In addition to talking about our books, we also signed a few. DUST, The Disappearance, and Corsonia. You Can't Be Serious: An inner-city teacher a-muses about school and life. program for high school students, organized by the Alliance for Safe Kids (ASK). The event, at Yorktown High School, featured a performance by John Morello. 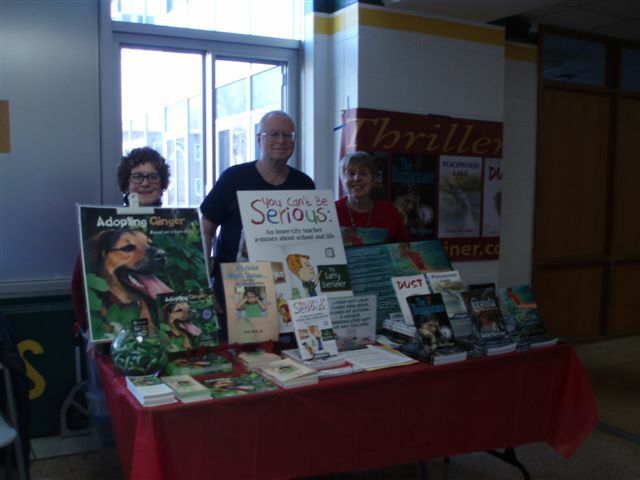 (narrow) table with authors Larry Berliner & Linda Griffin. Harriet loves reading my supernatural thrillers! in Queens, NY on February 2nd. 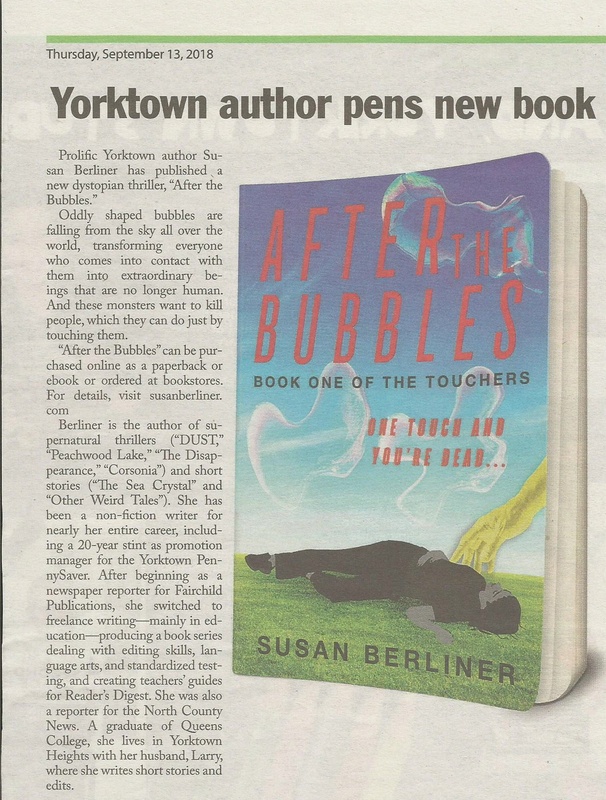 a signed copy of my new dystopian thriller, After the Bubbles. and Linda Griffin. We had a wonderful spot--near the elevator at the Mall entrance. Carmella chose my mind-control thriller, Corsonia, for her mother, Camille. amuses about school and life, for his daughter, a new teacher. cafeteria, right next to the cupcakes, cookies, and donuts. Yum! 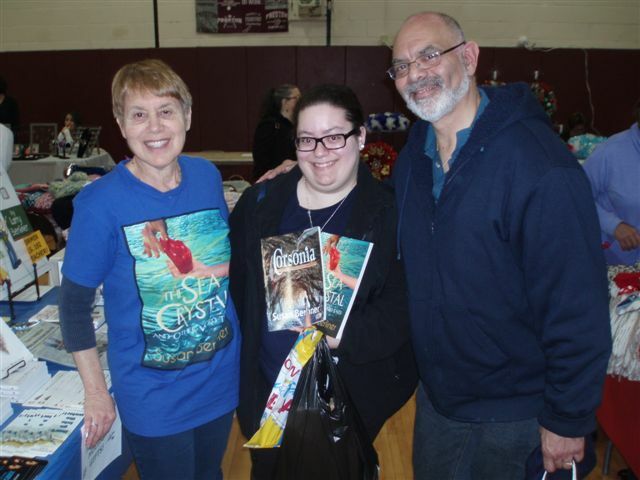 Jill purchased two of my novels--Corsonia and The Disappearance--for gifts. But she's going to read the books first. Leslie wanted a signed copy of DUST for Samantha, who's graduating college. Adriana, Emily, and Vika (16 and 19-year-old twins). 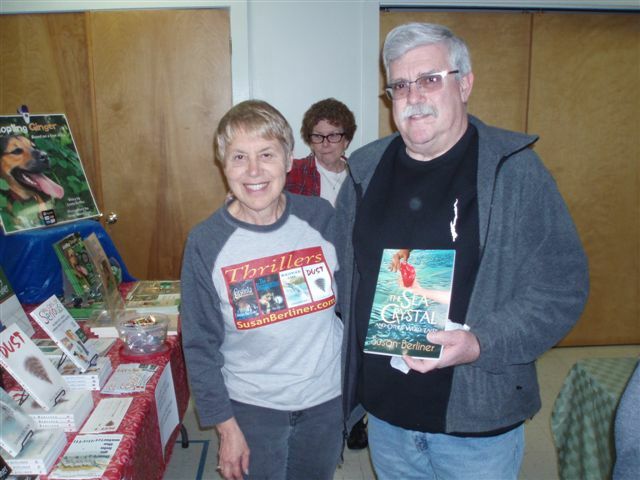 Cheryl chose The Sea Crystal and Other Weird Tales as a gift for her husband. Kevin enjoys reading mysteries so he selected a signed copy of The Disappearance. 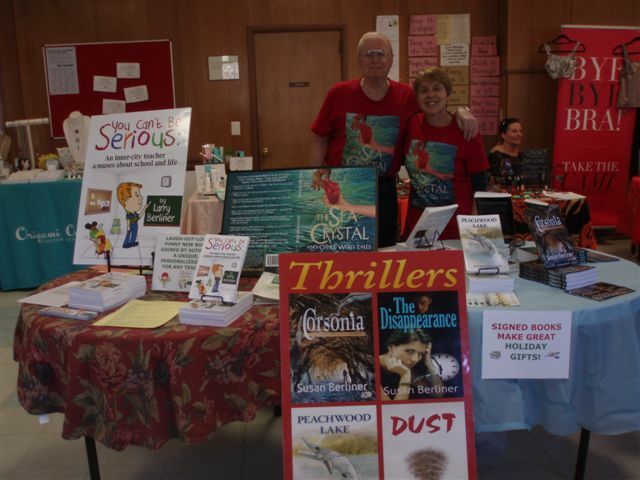 authors Linda Griffin and Larry Berliner so we had lots of room for our books. Judy was interested in mind-control so she chose a signed copy of Corsonia. a signed copy of DUST--and his dad agreed. Chandra had something to smile about--her new signed copy of The Disappearance. 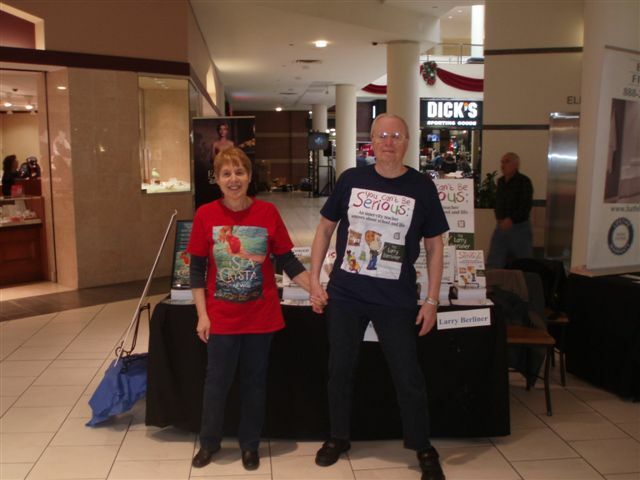 Tony purchased a copy of Corsonia for his wife, Ida, who loves supernatural thrillers. we had a wonderful location and lots of room to display our books. 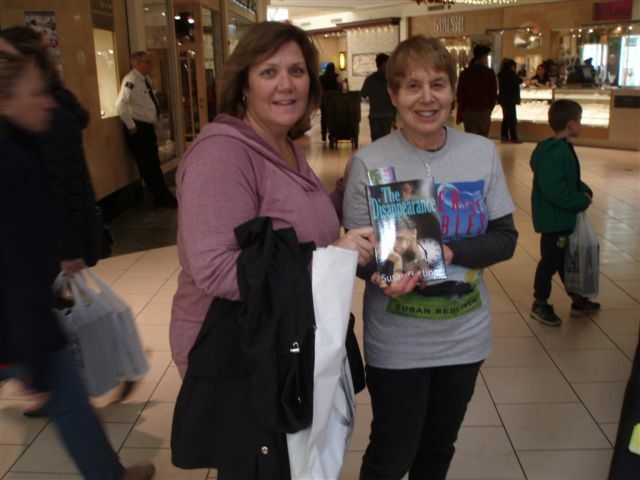 Unfortunately, most shoppers weren't interested in signed books as gifts. An inner-city teacher a-muses about school and life for her child's teachers. also selected a signed copy of The Disappearance. who loves receiving signed books. The Sea Crystal and Other Weird Tales were these readers' favorites. of craft gifts for the holidays. Simona, a librarian who loves reading Young Adult books. Maria was looking forward to reading her signed copy of Corsonia. 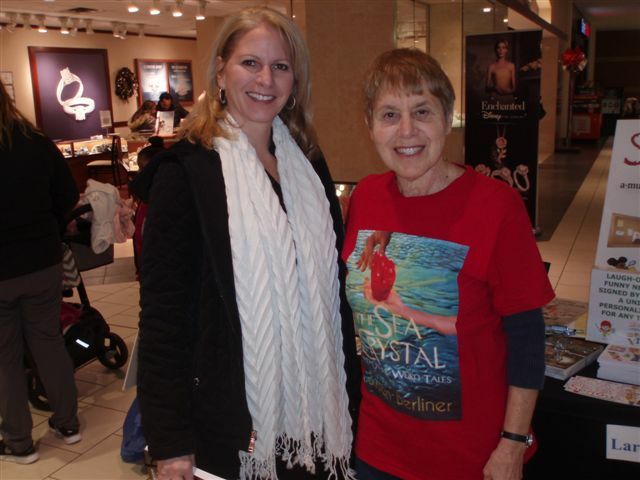 signed copy of The Sea Crystal and Other Weird Tales as a gift for her. selected two books as gifts for her--Peachwood Lake and The Disappearance. it drew a large crowd. 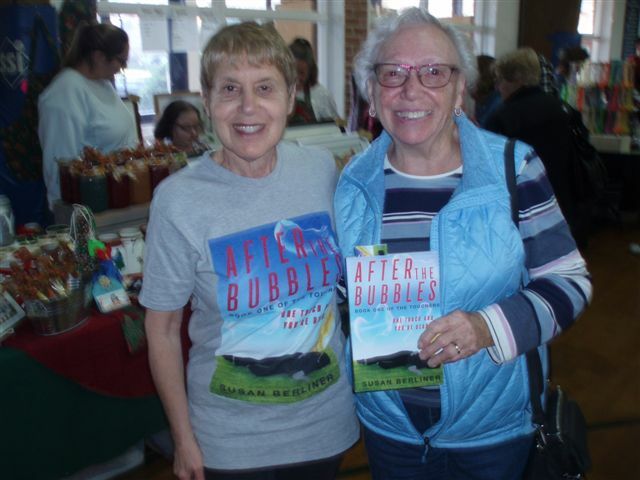 read my new doomsday thriller, After the Bubbles. Marie decided to get a signed copy of Corsonia as a holiday gift. time to read. She was looking forward to reading After the Bubbles. 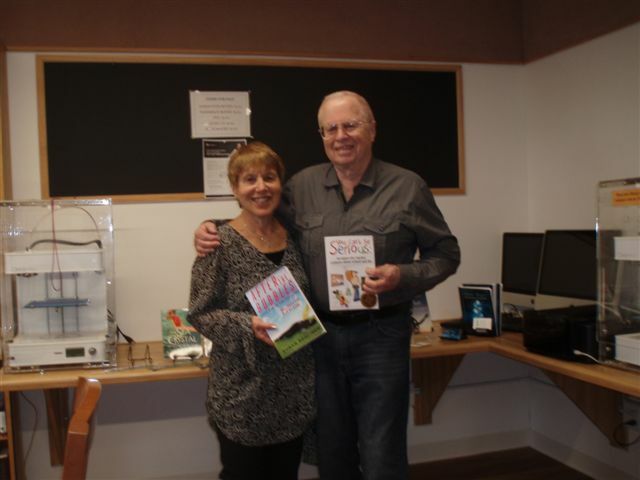 Larry Berliner and I showcased our books in North Castle Library in Armonk, NY. so we opted instead for individual conversations with library visitors. Barbara Solomon Josselsohn; financial author, Kolonji Murray. in Ossining, NY. It was a gorgeous early-fall day, 70 degrees and sunny. 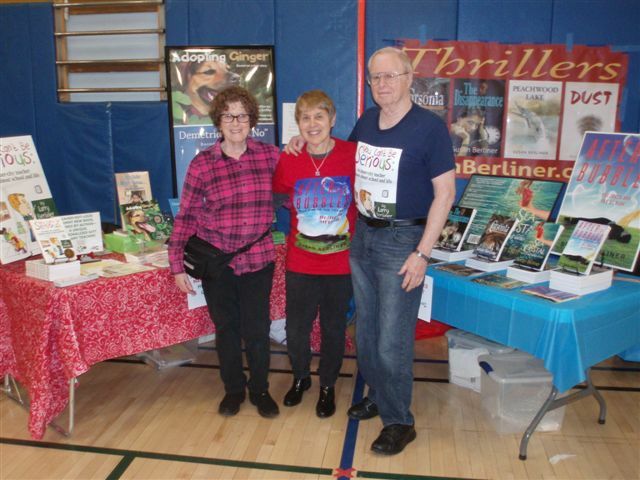 fellow authors Linda Griffin and Larry Berliner. The Sea Crystal and Other Weird Tales. which she intends to read on her train commute to work. Yorktown Assisted Living Residence (formerly Fieldhome) in Cortlandt Manor, NY. Other than some wind gusts (never good for posters), it was a lovely day. 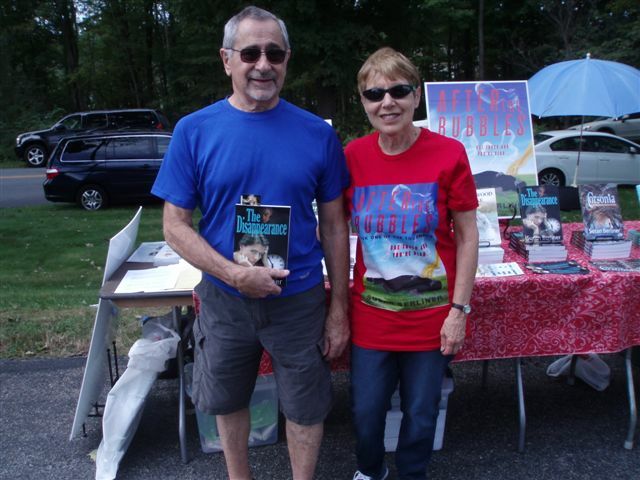 authors Linda Griffin and Larry Berliner. Lou, a mystery fan, chose my time travel thriller, The Disappearance. 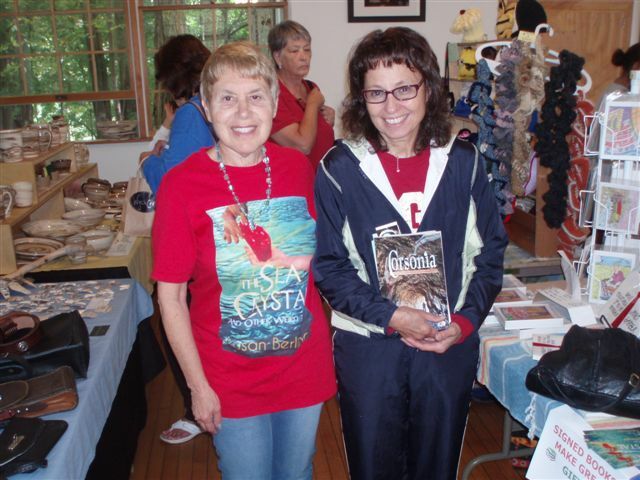 Debbie, a fellow vendor, wanted to read my mind-control thriller, Corsonia. cable TV show. We talked about our books and the writing process. in the July 24 edition of Northern Westchester Examiner. interested in reading books--but not purchasing them. 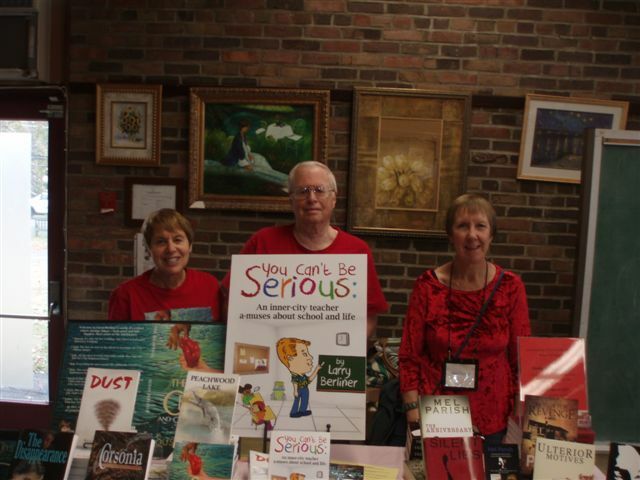 Each author had a large table so I had plenty of room to display all my books. 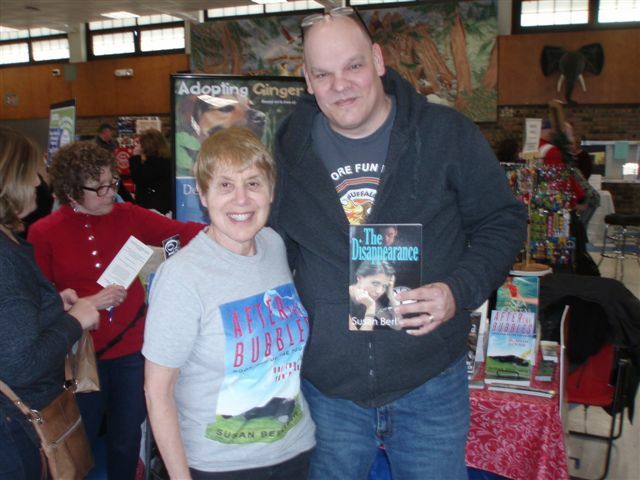 Elaine--a huge time travel fan--wanted a signed copy of The Disappearance. An inner-city teacher a-muses about school and life. a fellow Berliner--though not a relative. city teacher a-muses about school and life for his mom, a retired teacher. I was happy to talk about how I became a fiction writer. collection of short stories (to take a break from writing The Touchers). You Can't Be Serious: An inner city teacher a-muses about school and life. This time, we were on the ground floor near the main entrance--a good location. Bella purchased a signed copy of DUST for her 18-year-old sister, Gaby. 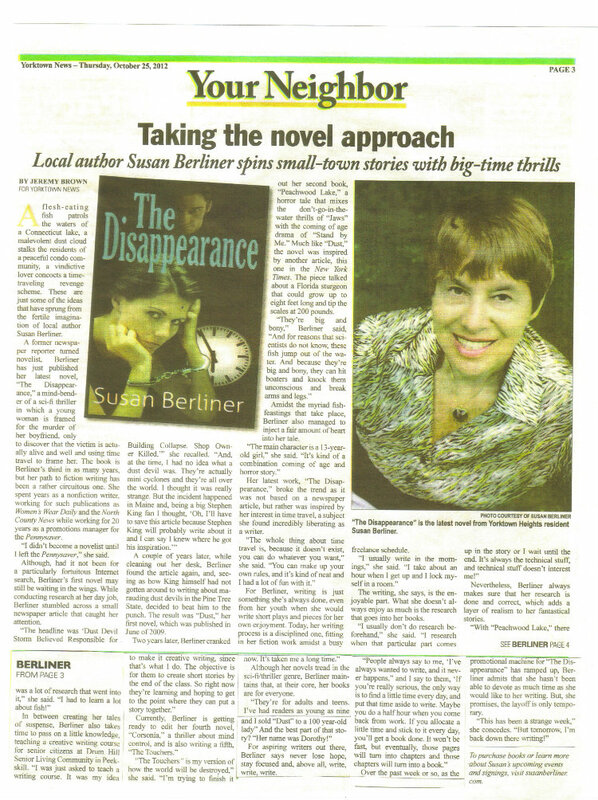 Susan chose a copy of The Disappearance for her mother, an avid reader. library visitors ignored our attractive displays and our books. Here's a picture of Larry and me in front of our table. 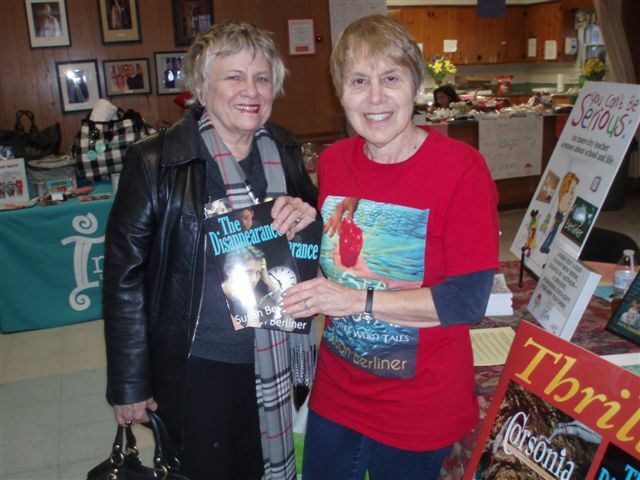 to sign books at Preston High School's Christmas Craft Festival. The Disappearance, for her 16-year-old daughter, Marisa. Peachwood Lake for her 12-year-old granddaughter, also named Anna. books--Corsonia and The Sea Crystal and Other Weird Tales. reading and writing fantasy, also wanted to read my weird short stories. read You Can't Be Serious. very cramped table and no place to sit, but it was still a fun experience. carefully examined all my books before making his choice. a quick and easy read for all ages. Mom, Janine, plans to read the book too. a signed copy of DUST. 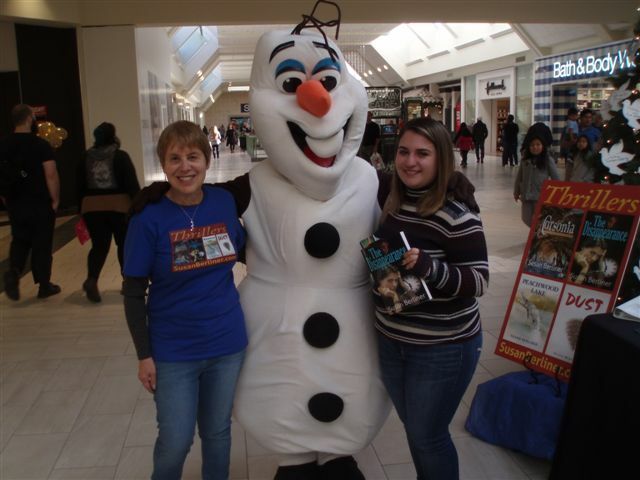 and apparently Olaf is also a fan of time travel thrillers. Corsonia, DUST, and Peachwood Lake. Analia, a school nurse and an avid reader, is looking forward to reading DUST. 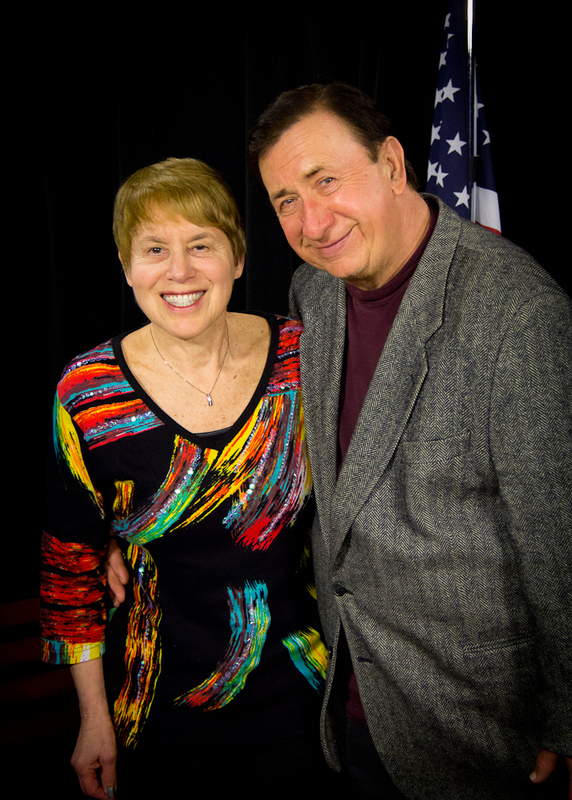 Larry Berliner and mystery and suspense novelist, Mel Parish. Alexandra, who turned 13 today. for herself and a signed copy of The Disappearance for her husband, Mike. chose a signed copy of my mind-control themed novel, Corsonia. vendors, this craft fair attracted many shoppers looking for holiday gifts. and Other Weird Tales for her 13-year-old daughter, Natalie. 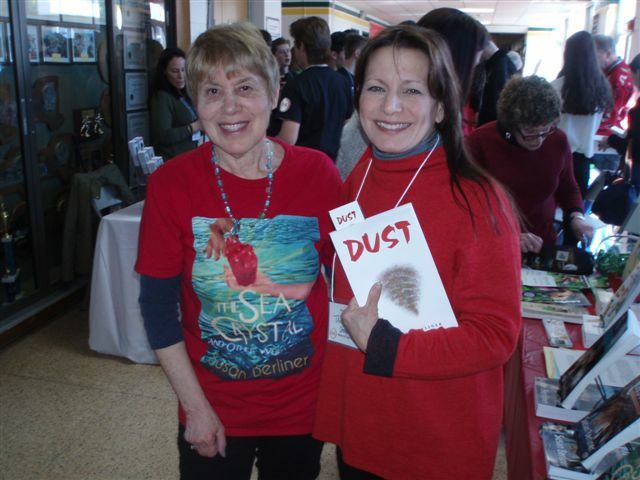 Judy, an avid reader, was excited about getting a signed copy of DUST. The Disappearance was a popular choice at this holiday fair. Gertrude also chose a copy of my time travel thriller. 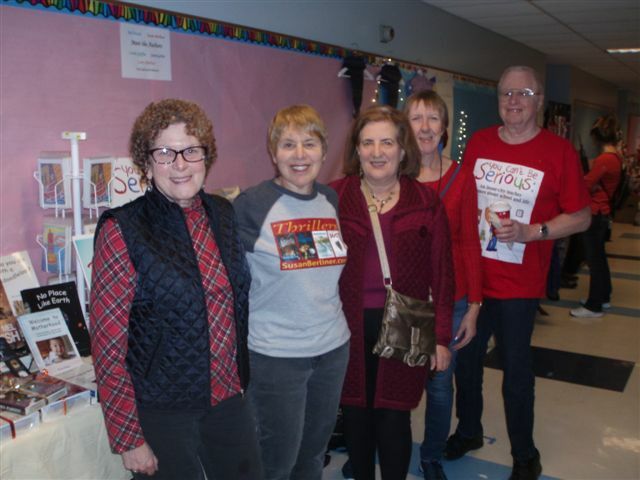 Holidays Artisan Fair in Croton, NY, the first seasonal event. with many shoppers buying gifts for the holidays. 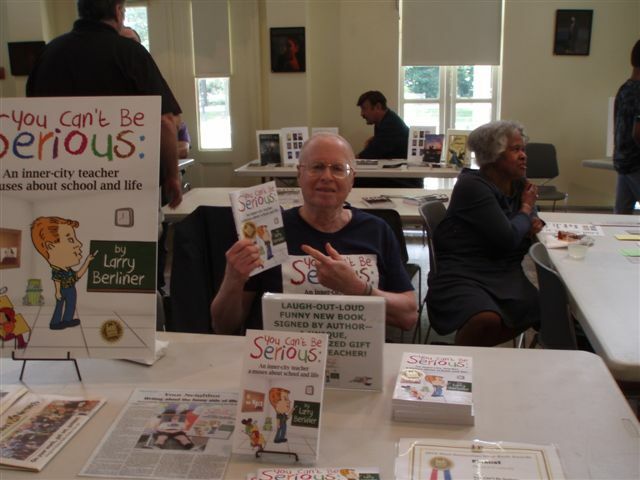 Larry had bought DUST (which he loved) at my first book signing in 2009. Now he was anxious to read The Sea Crystal and Other Weird Tales. An inner-city teacher a-muses about school and life for Amy, an avid reader. then decided to purchase my time-travel thriller, The Disappearance. Sheila was excited about reading my mind-control themed novel, Corsonia. and You Can't be Serious for his daughter. 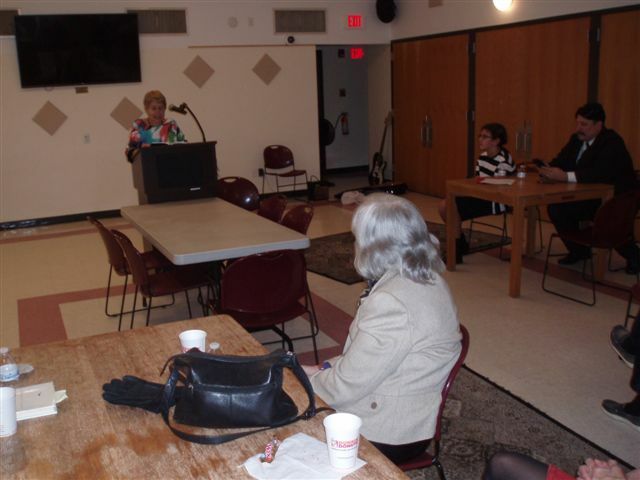 On October 27, I attended an Open Mic Night at the Somers (NY) Library. and Other Weird Tales. 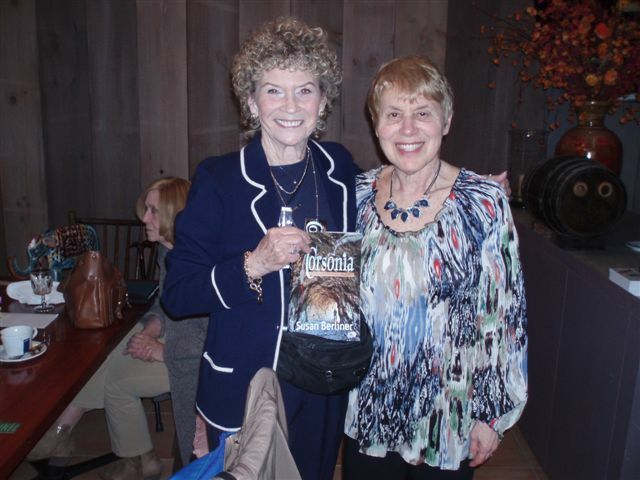 Many thanks to author Janet Garber for inviting me! Jackson, 12, was fascinated by the premise of Peachwood Lake. it focuses on Kady, a 13-year-old girl. genres--from novels and poetry to cookbooks, children's books, and memoirs. of Westchester's Arts & Crafts Fair in Mohegan Lake, NY. 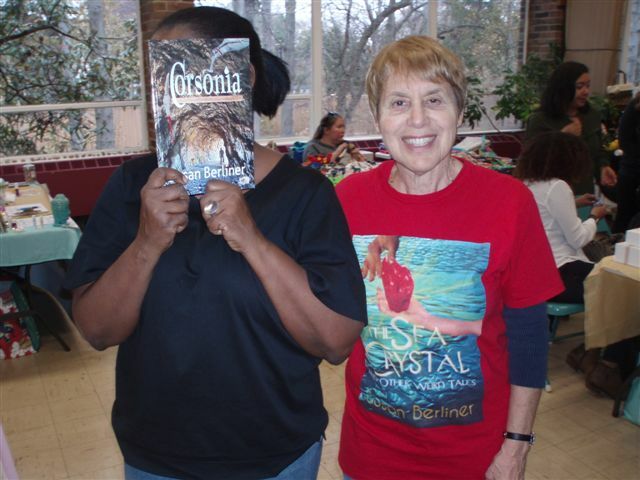 Carolyn was excited about reading her signed copy of Corsonia. wanted to read this evil-fish story. which was supposed to be a Spring Festival, but got rained out. on Albany Post Road, a main thoroughfare. 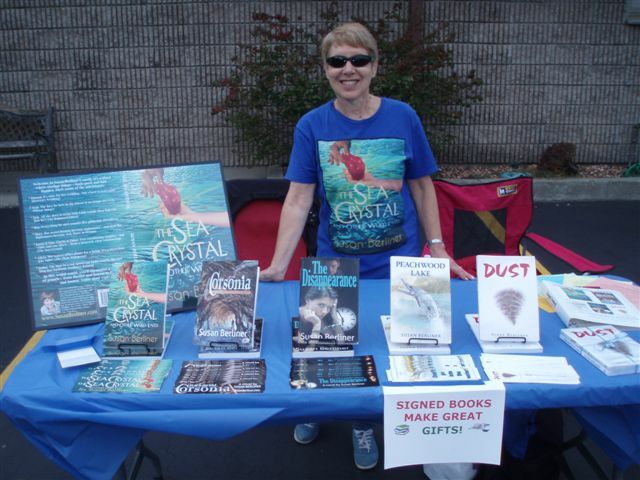 signed copies of DUST and The Sea Crystal and Other Weird Tales. Castalia, 10, an unfortunate Jets fan like me, wanted to read DUST. for her 21-year-old daughter, Chiara. 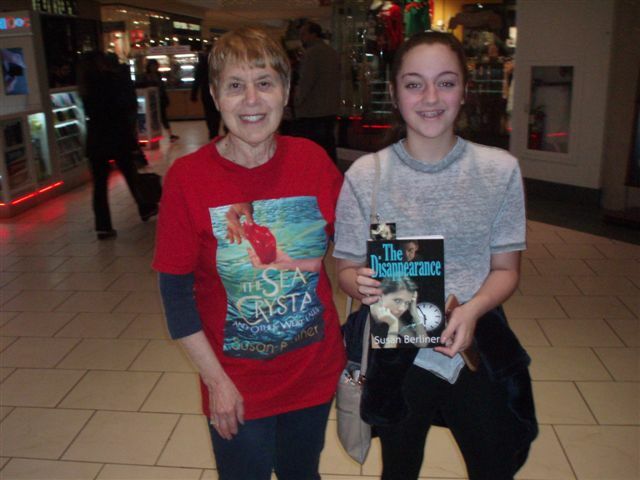 Zoe, 14, and her mom opted for a signed copy of The Sea Crystal and Other Weird Tales. who is running for re-election, took a moment to purchase a signed copy of DUST. hot and sunny. But since it wasn't windy, my posters stayed up. Sisters Sophia, 17 (left) and Hannah, 15, chose a signed copy of Corsonia. Carole wanted a copy of The Disappearance for her 18-year-old niece, Chrissy. 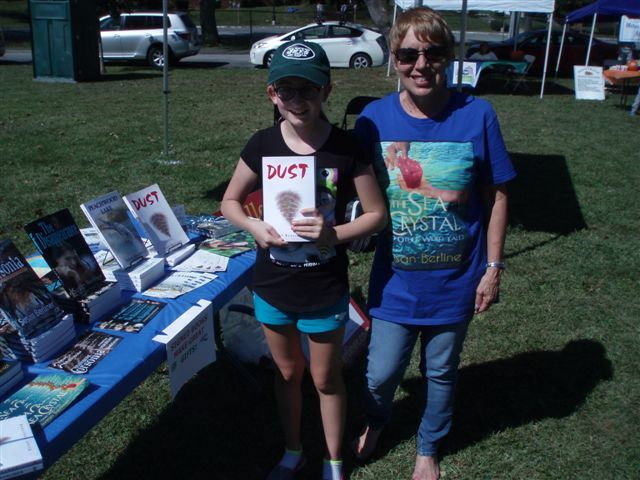 Linda chose a signed copy of DUST for her 11-year-old granddaughter, Lily. 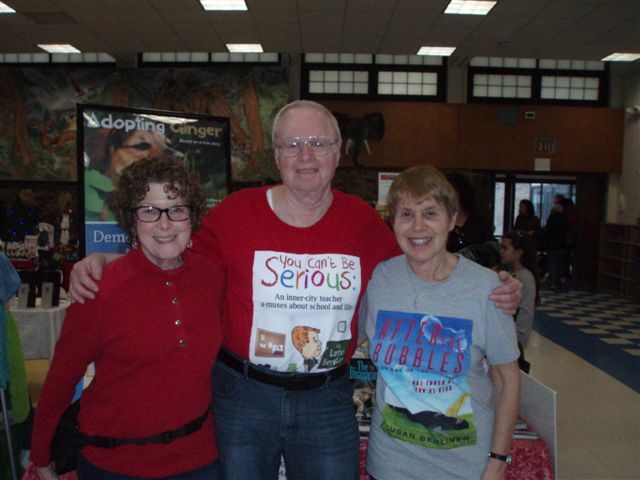 Bob Dumas, editor of the Mahopac News took photos of the vendors. first interview with me after the publication of DUST. 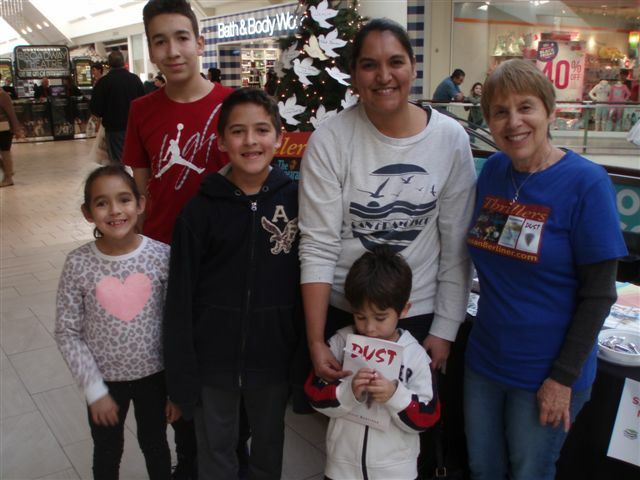 again held in the Jefferson Valley Mall in Yorktown Heights, NY. This was a YIKES! & TYKES event with parent/children's author, Linda Griffin. because it rained during the event. short story collection, The Sea Crystal and Other Weird Tales. reading their signed copy of DUST. 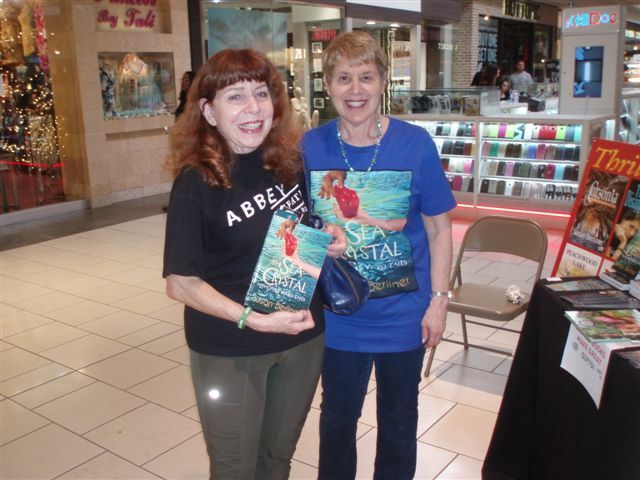 Ruby, an actress, chose a copy of The Sea Crystal and Other Weird Tales. 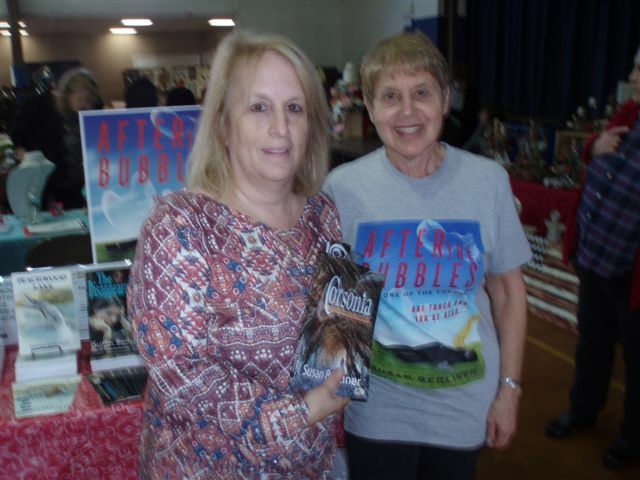 comic novelist, Janet Garber; and children's/parenting author, Linda Griffin. ...Nora also purchased a copy of my Twilight Zone-like short story collection. and short stories were about. interesting items for sale and fun activities for children, few people attended. Fourteen-year-old Alyssa wanted to read my time travel thriller, The Disappearance. Peachwood Lake, stopped by my table. Keith, a "Twilight Zone" fan, chose a signed copy of The Sea Crystal and Other Weird Tales. 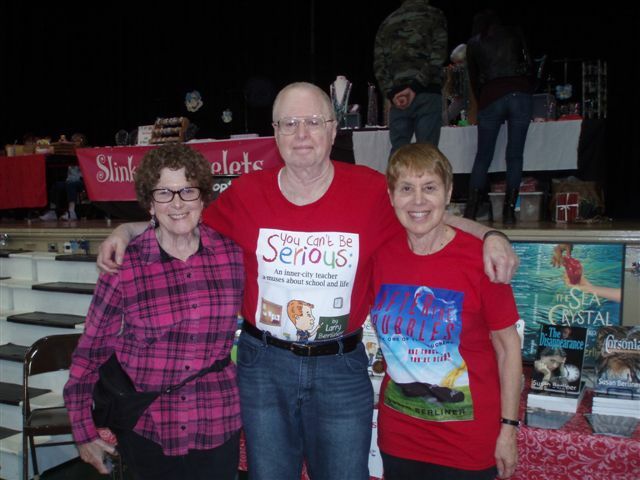 On April 2, I showcased my books at SAVE A LIFE 2017, at Lakeland High School in Shrub Oak (NY). which we all attended--visitors strolled along the hallway looking at the various exhibits. for her 13-year-old niece, Savannah, who wants to be a writer. Signed Books Make Great Holiday Gifts! December 23rd to purchase a last-minute gift for her boss, Linda, an avid reader. I met Patti at a local restaurant that night to give her a signed copy of Corsonia. he is giving her a signed copy of The Disappearance. DUST and Peachwood Lake for her live-in babysitter. sat on the window ledge's heating unit--a bit warm on our rear ends. Pat was excited about reading her signed copy of The Disappearance. Corsonia and The Sea Crystal and Other Weird Tales. 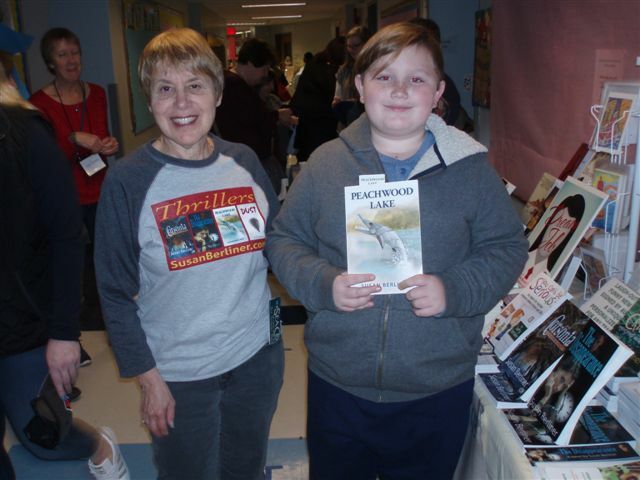 Twelve-year-old Sophia chose autographed copies of Peachwood Lake and Corsonia. 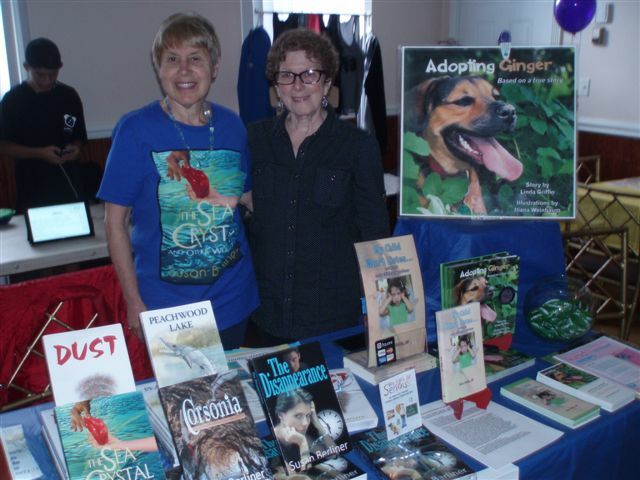 and author Linda Griffin's award-winning children's book, Adopting Ginger. 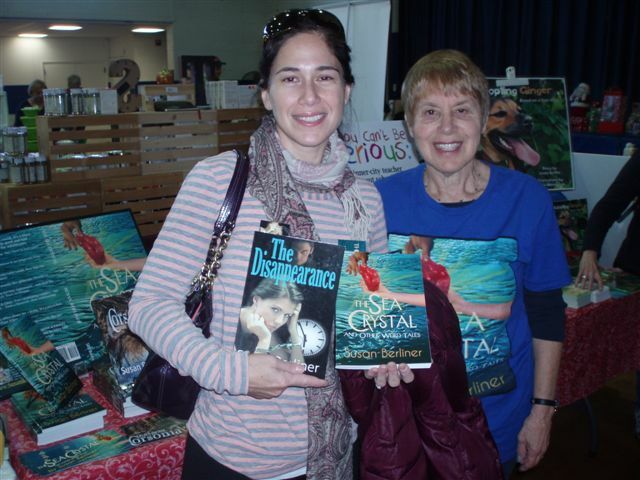 Isabelle chose a signed copy of The Disappearance as a gift for her friend, Ashley. Santa and Olaf checked out my "cool" books and stories. 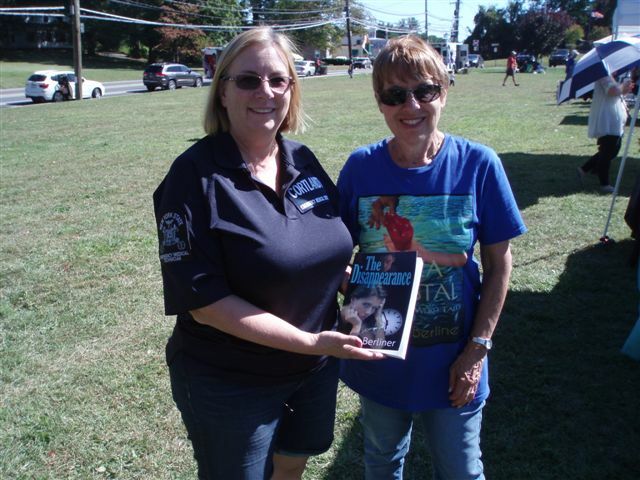 Denise chose a signed copy of The Disappearance for her 16-year-old nephew, Alex. ...thirteen-year-old Francesca was excited about reading The Disappearance. my short story collection, The Sea Crystal and Other Weird Tales. suspense author Mel Parish (l) and urban paranormal author/poet Kirsten Campbell. Joe, a 15-year-old avid reader, was looking forward to reading DUST. Helen chose a signed copy of Peachwood Lake. Sisters Elika, 9, and Malisa, 11, who both love to read, will share a copy of DUST. for residents and staff of The Osborn, a senior living community in Rye, NY. 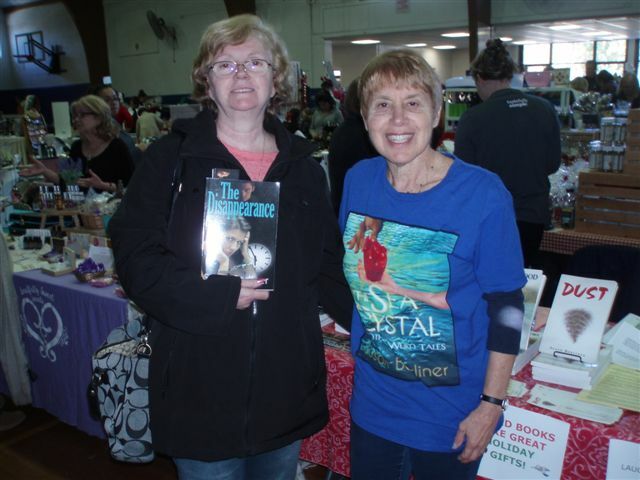 I shared a large table with contemporary mystery & suspense author, Mel Parish. 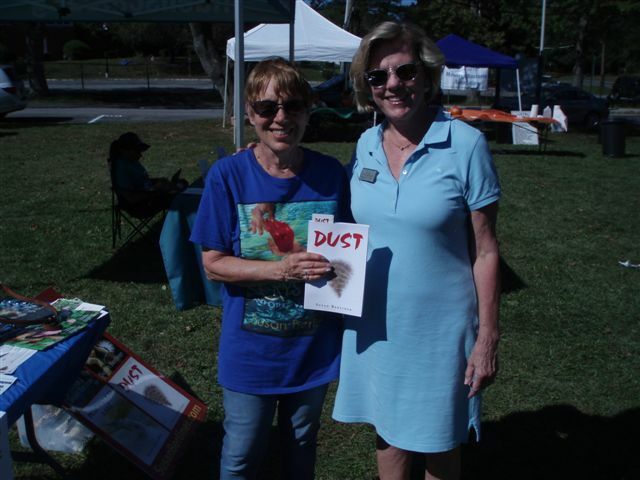 Barbara, a former advertising agency owner, chose a signed copy of DUST. Prunella, a Bronx poet, was excited about reading her signed copy of Peachwood Lake. people were shopping for gifts--and for books. This was a YIKES! 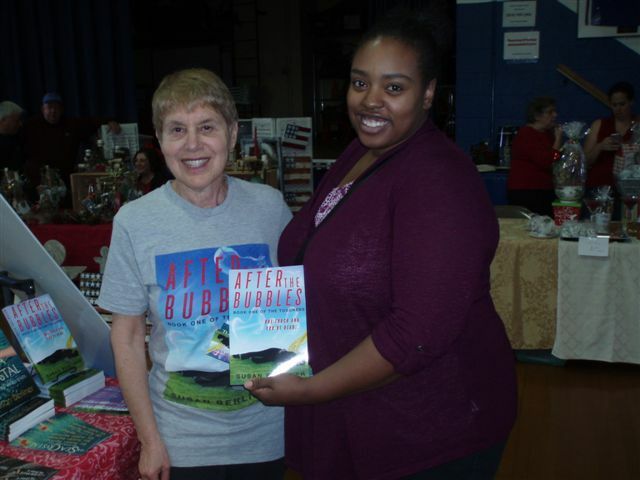 & TYKES event so I shared a table with author, Linda Griffin. Cathleen, the eldest of her four daughters. 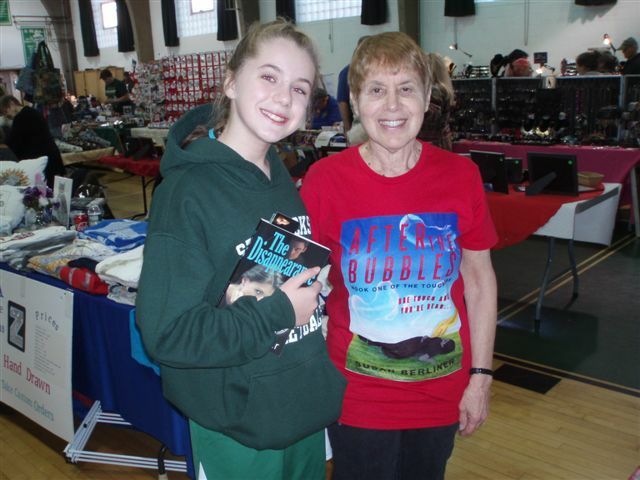 Avid reader Amy (with Gracie) wanted signed copies of all five of my books. 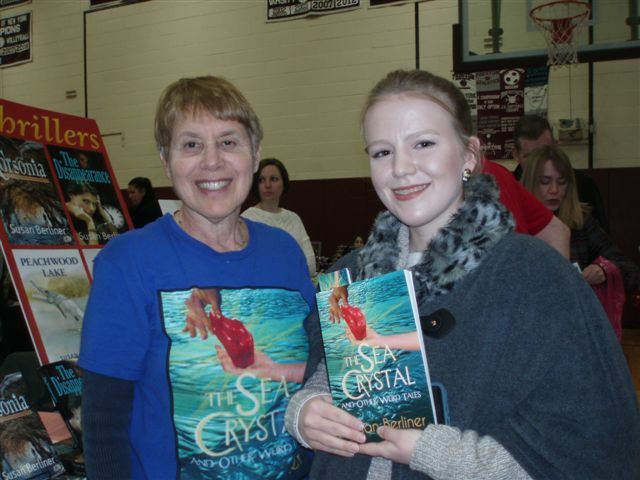 Lee Ann chose a signed copy of The Sea Crystal and Other Weird Tales. 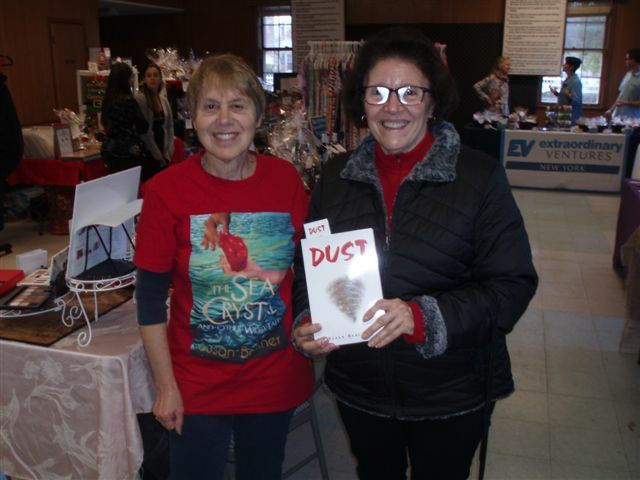 At the end of the event, church volunteer Gloria chose a signed copy of DUST. 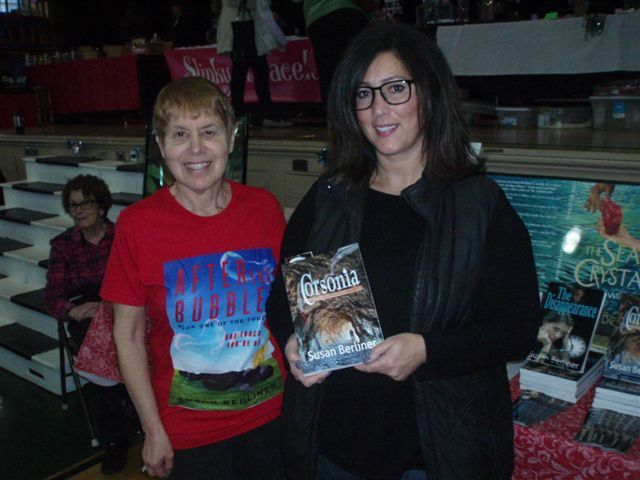 Glady was interested in mind-control so she chose a signed copy of Corsonia. Heavenly Helpers Relay for Life Team & the American Cancer Society. children's and parenting author, Linda Griffin. Mary Ann, Sue, and Gail, the event organizer. collection, The Sea Crystal and Other Weird Tales. 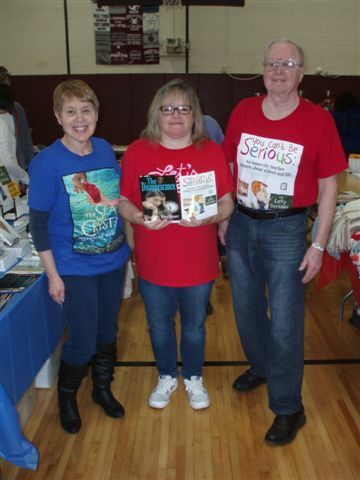 booth, with authors Mel Parish and Linda Griffin, was across from the fire house. Herm was fascinated by the concept of dust devils so he wanted a copy of DUST. 13-year-old daughter Gabriella--DUST and Corsonia. copy of The Sea Crystal and Other Weird Tales. 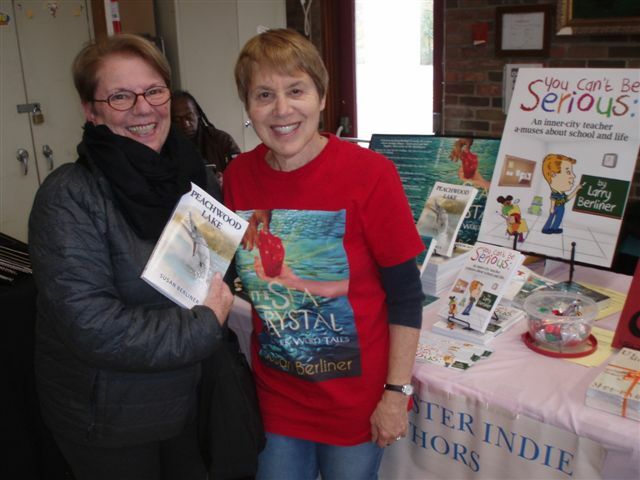 Westchester Indie Authors (WIA) at the Eastchester (NY) Library. European witches to poems and, of course, thrillers. talked about the pros and cons of publishing non-traditionally. Rinku Bhattacharya, author of Indian cookbooks, gave a spice demonstration. 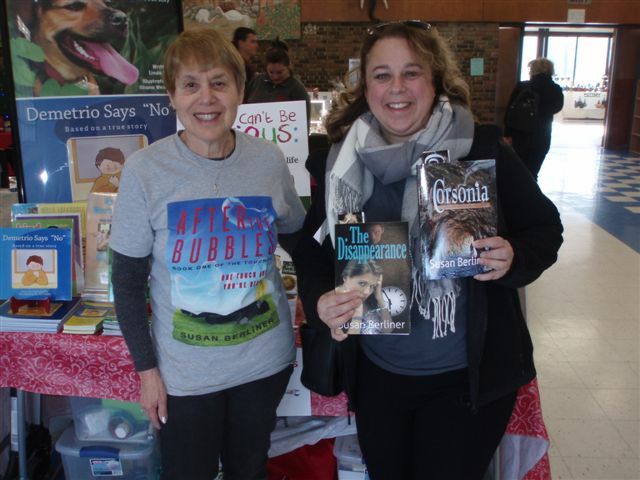 children's author Linda Griffin; and urban paranormal author, Kirsten Campbell. Here I explained how I got the idea for Peachwood Lake. We had a small, but enthusiastic, audience throughout the 5-hour presentation. occasional wind gusts that made displaying signs and bookmarks difficult. on the table. 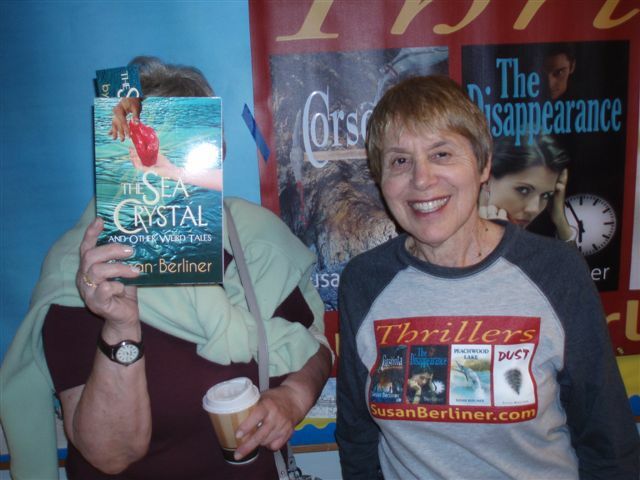 Notice my new "Sea Crystal" tee shirt. Beth was excited about reading The Sea Crystal and Other Weird Tales. Now she chose a signed copy of the mind-control novel, Corsonia. The Sea Crystal and Other Weird Tales for herself and DUST for her daughter, Allison. 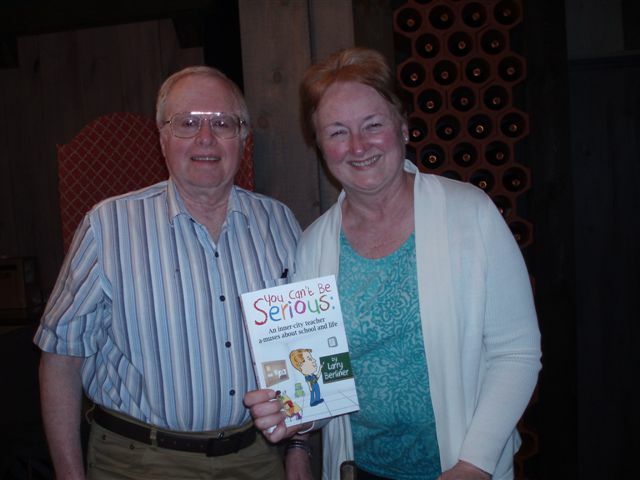 Linda and I each spoke about our books and read a few excerpts. Afterwards, we answered questions from the audience. We had a small, but attentive, audience--and it's always great to talk writing! in Yonkers, NY. It was a gorgeous beach day, which cut down on shopper traffic. I signed a copy of The Disappearance for Lilly's 18-year-old daughter, Hannah. But Lilly also intends to read the time travel novel. Sheryl was excited about reading her copy of The Sea Crystal and Other Weird Tales. My table was against the escalator, which enabled me to hang my banner. The Sea Crystal and Other Weird Tales for his wife, Norean, an avid reader of fiction. This was one of the many dance performances that took place in front of my table. The girls did a terrific job, but no one could look at my books during that time. of my new paranormal short story collection. "The Star Spangled Banner" at the beginning of the event. humid, which held down the crowds. Still it was great to talk to people about my books. and it was exciting to show off my book of short stories. returned to my table to tell me he had already started reading one of the stories. Carmine, a fan of time travel stories, chose a signed copy of The Disappearance. Kacie, who had read and enjoyed DUST. Dave chose a signed copy of The Disappearance--summer reading for his wife, Jill. because he prefers short stories to lengthy books. 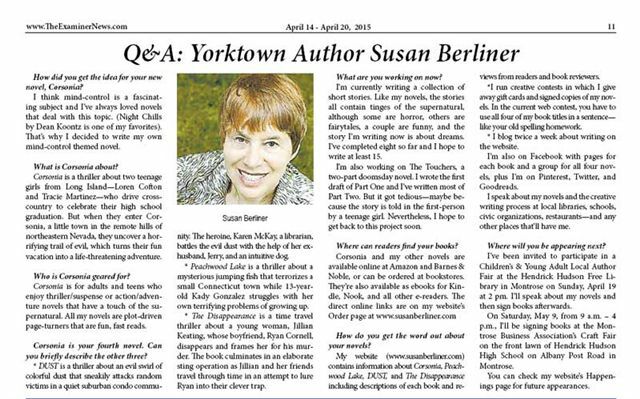 ran in the May 24th edition of The Northern Westchester Examiner. Eleven-year-old Gracie was looking forward to reading her signed copy of DUST. Lisa chose a copy of The Disappearance for her 21-year-old daughter, Liz. who, like Kady, the novel's 13-year-old main character, hopes to become a writer. DUST, Peachwood Lake, and The Disappearance. 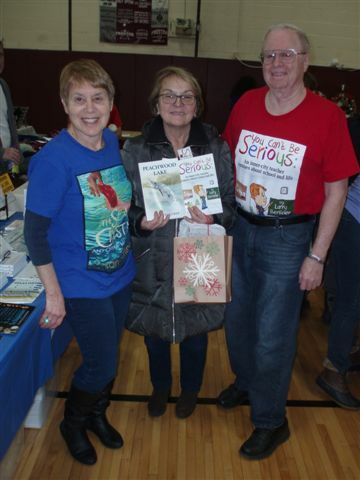 On December 5, I signed books at a Holiday Boutique at the Montrose (NY) Fire Department. who, like Kady, the book's 13-year-old main character, wants to be a writer. ...he returned to pick up a signed copy of DUST. her two daughters, ages 12 and 19. Black Friday Extravaganza in Yorktown, NY. Finally, people were in gift-buying mode! It was a super event so I've posted a bunch of photos. author Linda Griffin's Adopting Ginger and My Child Won't Listen. I signed both DUST and The Disappearance for 12-year-old Alexa. a thriller starring a 13-year-old girl. 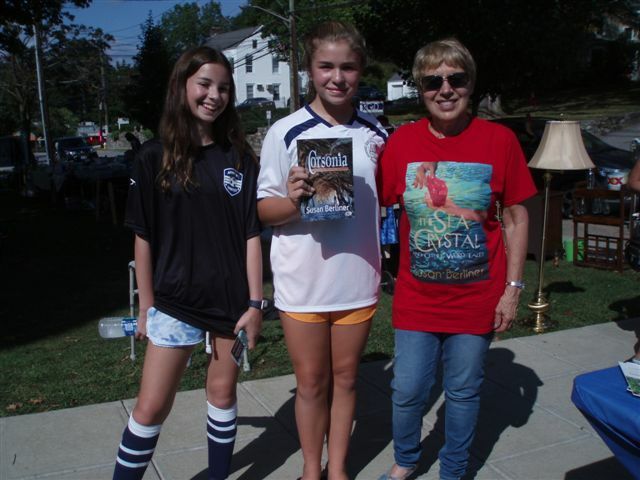 Michelle chose a signed copy of Corsonia for herself and her two teen daughters. Jennifer wanted a signed copy of The Disappearance for her 12-year-old niece, Kate. each a gift, inscribed to one of her daughters, ages 14, 17, and 22. Not everyone was shopping for gifts. Sue wanted The Disappearance for herself. Ruojing was looking forward to reading my newest novel, Corsonia. These fourteen-year-old friends were really excited about reading my thrillers. Michelle chose Peachwood Lake and Valiana selected The Disappearance. in Buchanan, NY. Here come the pictures! This was a YIKES! 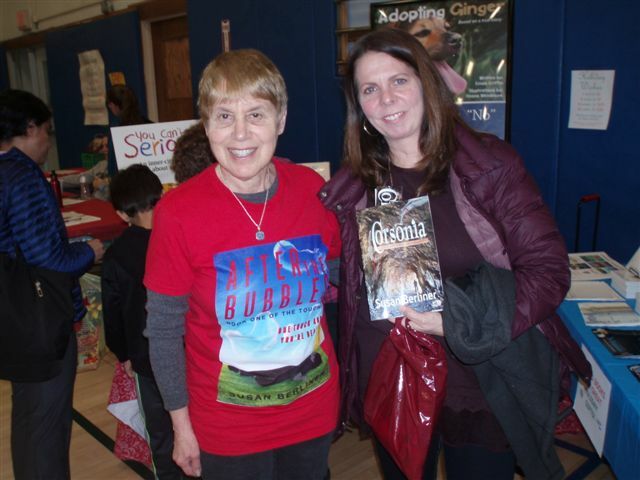 & TYKES event so I again shared a table with author Linda Griffin. "Everything $50!," in October when I read it to his class. a gift for her 16-year-old daughter, Sara. Even Santa loves to read a good thriller! Carmen, a fellow vendor, was excited about reading DUST. Helen was excited about reading her signed copy of The Disappearance. 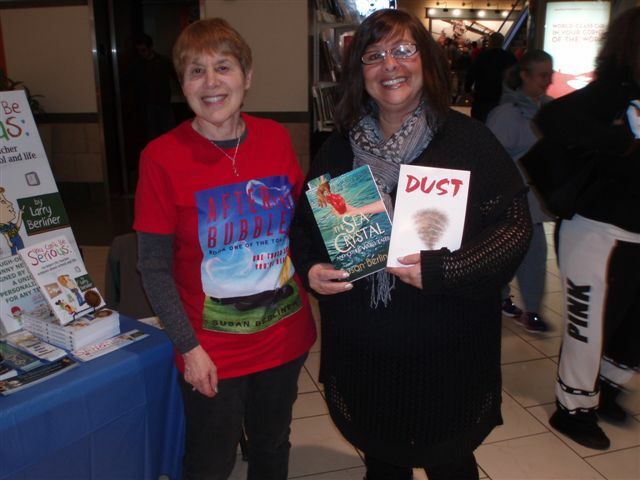 Kathy, an avid thriller reader, chose both DUST and The Disappearance. 15-year-old Julia was looking forward to reading her signed copy of The Disappearance. 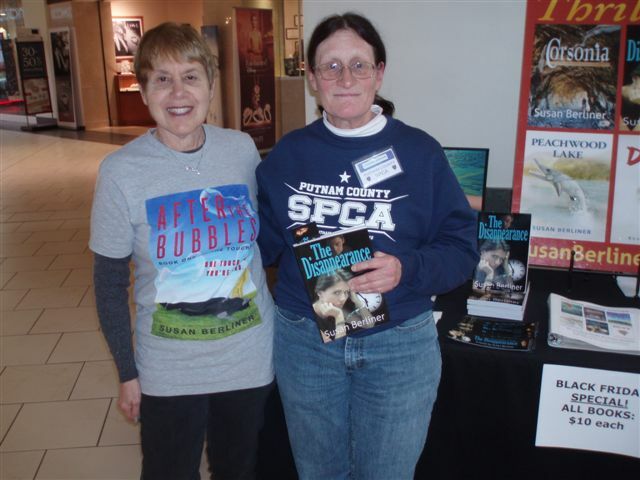 Vicki, from the Putnam Humane Society, brought Oreo, who's up for adoption, to the event. She was looking forward to reading DUST, which features Benny, a perceptive dog. The dynamic duo of Elvis and Santa entertained the crowd. 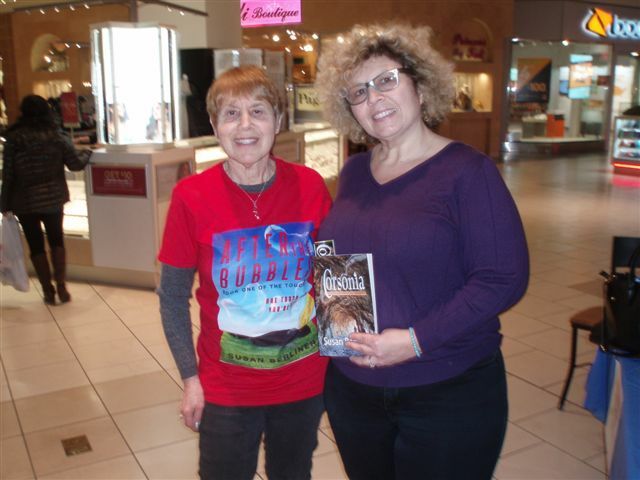 Eva chose a signed copy of the time-travel thriller, The Disappearance. PTA President, Laura, chose signed copies of Peachwood Lake and The Disappearance. Skylar, a 4th grader whose mother coordinated the event, got all four novels while Ezra, a 2nd grader, chose DUST. 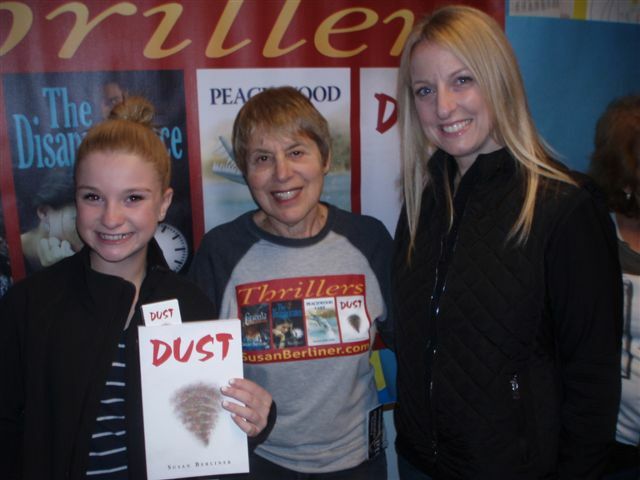 Emily, a 4th grade writer, chose DUST...and so did fellow 4th grader, Jason. Joe, a 7th grader, selected DUST while 4th grader Mia chose The Disappearance and DUST. Fifth graders Madison (left) and Tiffany both chose The Disappearance. Tiffany also selected DUST. Eddy chose DUST while Valerie, my "ambassador" on Wednesday, selected Corsonia. Both are 5th graders. in Buchanan, NY. I really enjoyed the experience--and I think the kids did too! their favorite books. Note the "Book Fairy" (aka Reading Teacher) in the forefront. I read "Jeremy's Toys," a short story from my new collection, to the third graders. Before I read to the fourth graders, principal Josh Cohen spoke to the children. I read "Everything $50!" to both the fourth-graders and fifth-graders. On October 20, I was the guest speaker at St. Patrick's Senior Club in Yorktown, NY. I talked about my novels (of course!) and the creative writing process. Lots of people attended the meeting--nearly a hundred. This group seems to schedule many activities. Very impressive! When I do a presentation, I always hand out news clippings of real dust devil events. Here, Joan, the program chairperson, helped me distribute my papers. ...and, after seeing all those dust devils, Pat wanted to read DUST. Joan was anxious to read her signed copies of Corsonia and DUST. On October 3, I participated in "Think Pink" at the Jefferson Valley Mall in Yorktown, NY. and dance performances. Here come the photos! This was a YIKES! 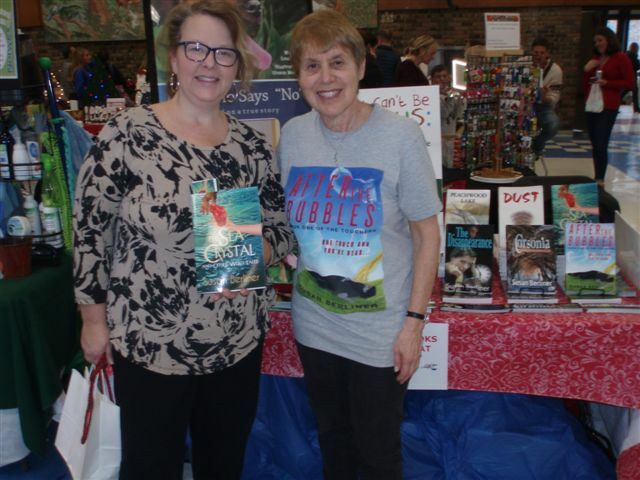 & TYKES event so I shared a table with fellow author Linda Griffin. Since we were again located next to the escalator, I was able to display my banner. to choose a signed copy of DUST. "The Battle of Cancer: The Power of Friends." 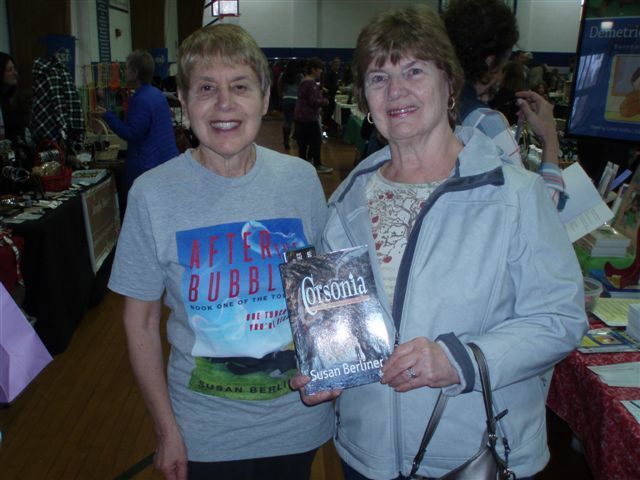 Pat was looking forward to reading her signed copy of Corsonia. a good thing because the poster didn't do too well on the table. Fourteen-year-old Julianne also chose a signed copy of Corsonia. Suzanne Weyn. Her latest series is The Haunted Museum. Notice my spiffy new blue "Thrillers" shirt--and my banner taped to the escalator wall. Lily, a 15-year-old high school student, also decided to read Corsonia. At the end of the event, I was interviewed by a reporter for a local TV station. I hope I sounded okay--because by then I was exhausted! the Jefferson Valley Mall in Yorktown Heights, NY. without wind, sun, and rain--weather elements that harm my books and poster. 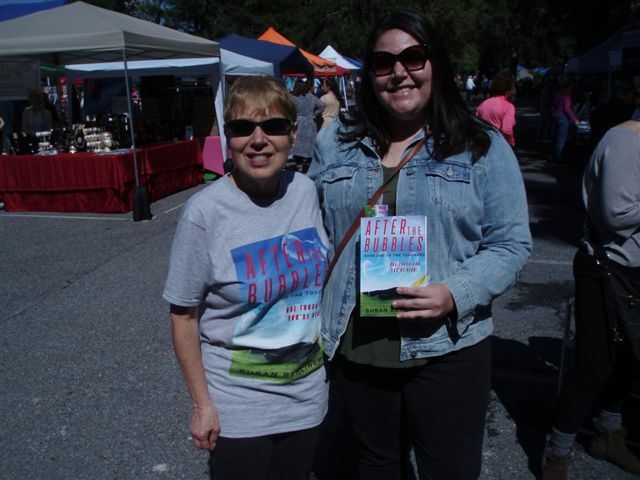 I signed a copy of Peachwood Lake for Kudrat and her daughter, Wiqayat. Charles chose a signed copy of The Disappearance for his wife, Leslie. mother/daughter fundraiser on the Grange Fair grounds in Yorktown Heights, NY. For the first time, I was able to hang my "Thrillers" banner, which I think looks great! Mackenzie was looking forward to reading my new mind-control thriller, Corsonia. 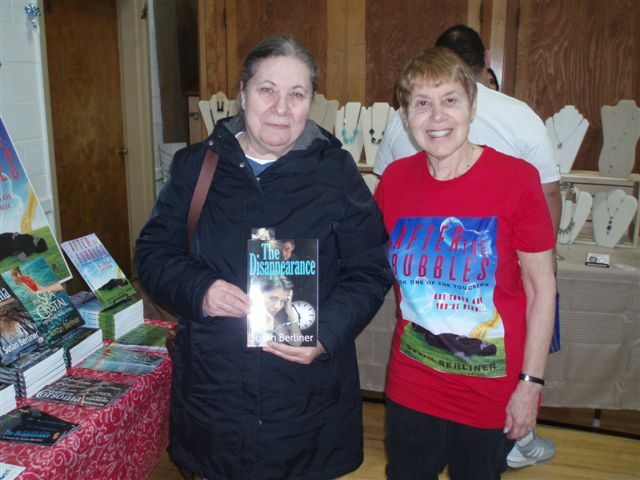 Edna chose a signed copy of my time-travel thriller, The Disappearance. and for Matthew, his 14-year-old son. her 14-year-old niece, who has read--and loved--all my other books! 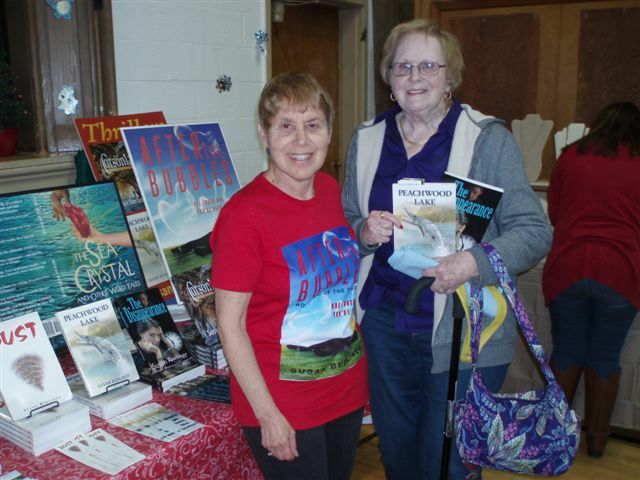 On May 9th, I signed copies of my novels at the Spring Craft Fair in Montrose, NY. This was a YIKES! 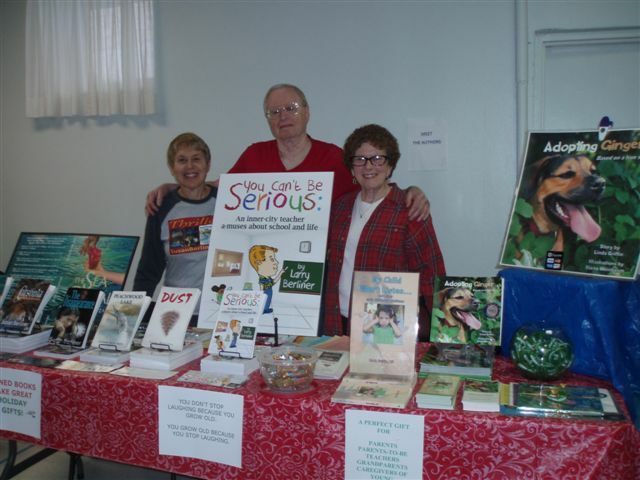 & TYKES event so I shared a table with author Linda Griffin. We were on the front lawn of Hendrick Hudson High School, visable to traffic on busy Route 9A. the weather was quite pleasant. who was turning 16 the next day. Ann wanted a signed copy of Corsonia for her 19-year-old granddaughter. Lorelle plans to give her copy of Peachwood Lake to someone as a gift. Alexa is giving a signed copy of The Disappearance to her mom, Karen, for Mother's Day. 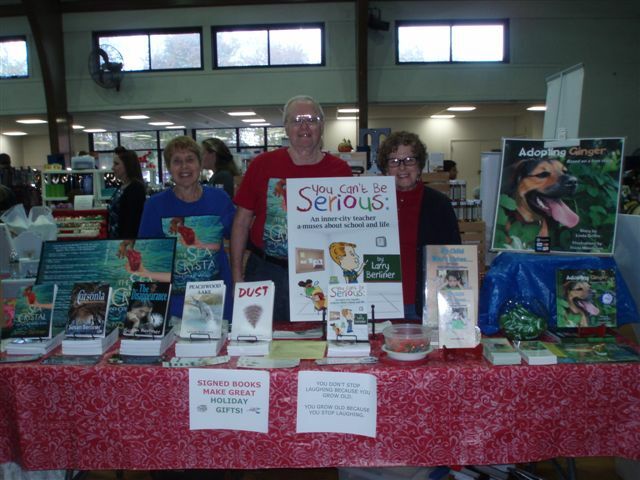 Linda Griffin, was unable to attend, I displayed her books with my four novels. for his upcoming flight to Japan. Thirteen-year-old Jami, chose a signed copy of Corsonia. Cherryl, an eighth grader teacher in the Bronx, plans to share DUST with her students. my creative writing techniques and my new novel, Corsonia. at the Westchester County Center in White Plains, NY. My Child Won't Listen... and the children's book, Adopting Ginger. It was a spacious venue--and we each had our own large table. for her upcoming trip to Amsterdam. 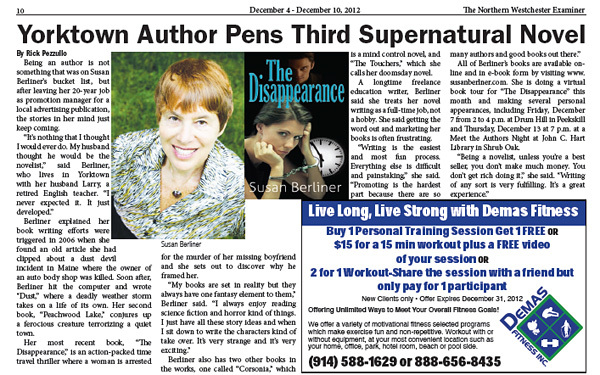 Twelve-year-old Lauren wanted a signed copy of The Disappearance. and DUST for her 19-year-old niece. and I was glad to oblige. 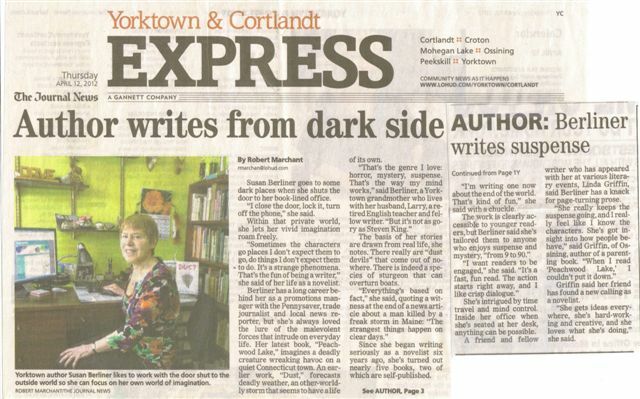 with a writing tip for aspiring authors and an excerpt from Corsonia. at Destination Bistro, a terrific new restaurant in Yorktown Heights, NY. except for one little detail: No one was interested in our books. Sometimes, it's tough being an author! We'll try again next month. On January 31, fantasy author A.F. Stewart interviewed me on her blog. The interview includes a long excerpt of Corsonia. 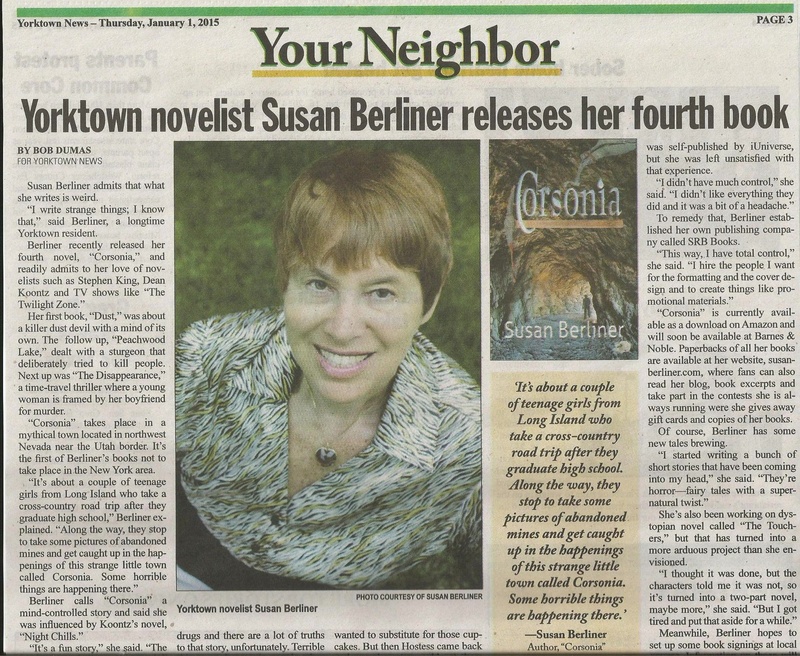 in the January 1st edition of the Yorktown (NY) News. Hope you can read the two-piece scanned article! the Montrose (NY) Fire House. The weather was rainy, but at least it wasn't snowy--and we were inside. the parenting book My Child Won't Listen... and the children's book, Adopting Ginger. The Disappearance for the library's collection. Fifteen-year-old Sara also chose The Disappearance. ...and Heather selected DUST, inscribed to her 13-year-old son, Tony. 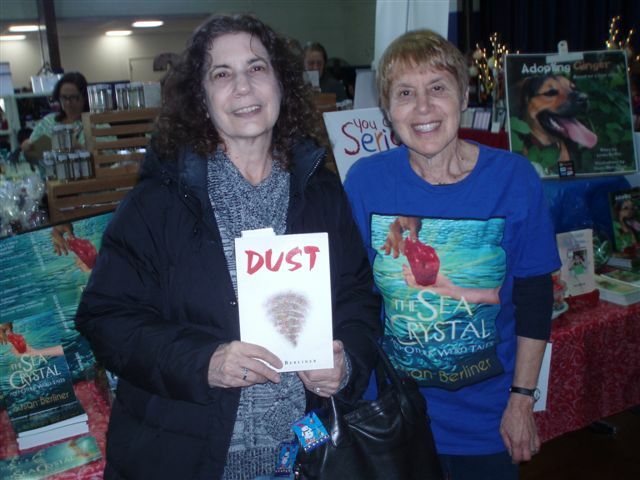 Lisa, a fellow vendor, also chose DUST, which she had inscribed to her mom, Anne. in Mohegan Lake, NY. Here come the pictures! a sequel to Jane Austen's Pride and Prejudice. Twelve-year-old Emily decided to read DUST. for her 10-year-old niece, Chungshim. Becky was excited about reading The Disappearance. chose signed copies of Peachwood Lake and The Disappearance. Cortlandt Town Center in Mohegan Lake, NY. I had a terrific time! with no rain, no wind, and no cold. My poster didn't fall down once! Bianca was excited about reading her signed copy of The Disappearance. Jeanne decided to read all my novels: DUST, Peachwood Lake, and The Disappearance. but she intends to read the time travel novel too. Since this was also a Wellness Fair, we had zumba dancing in the hallway. ...Brunie wanted to read The Disappearance too, as did several others. It was a banner day for time travel! 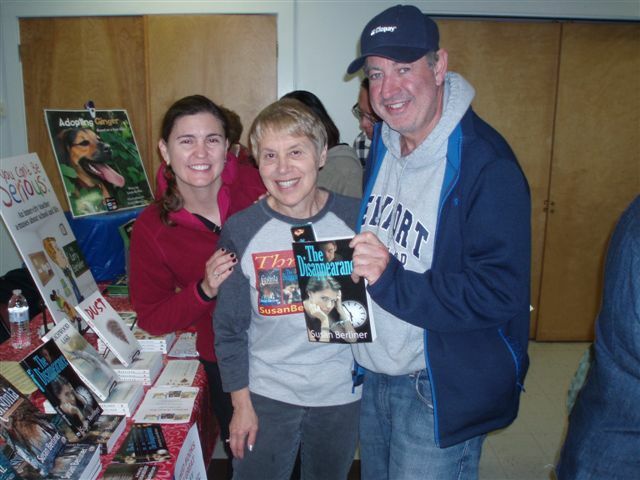 the Montrose (NY) Business Association's Autumn Craft Fair. sunny, not windy, with temperatures in the mid-60s. and he told me he'd witnessed sturgeons jumping in the Hudson River. Naturally, he decided to read Peachwood Lake. Fourteen-year-old Christina chose a signed copy of The Disappearance. Tania, an avid reader, looked forward to enjoying DUST. decided to read a copy of The Disappearance. which usually includes more than 70 vendors. fewer people participated and attended. And everybody froze. The event started at 9 am, but I arrived at 1 pm, after the rain. We were in the gazebo to protect our books from rain, but it was still cold. Melissa wanted an autographed copy of DUST. in Cortlandt Manor, NY, a fun-filled event for adults and kids. It was a lovely sunny day, but quite windy. Note the tape attached to my poster. It didn't help. Lynn, a former co-worker, wanted a signed copy of The Disappearance. 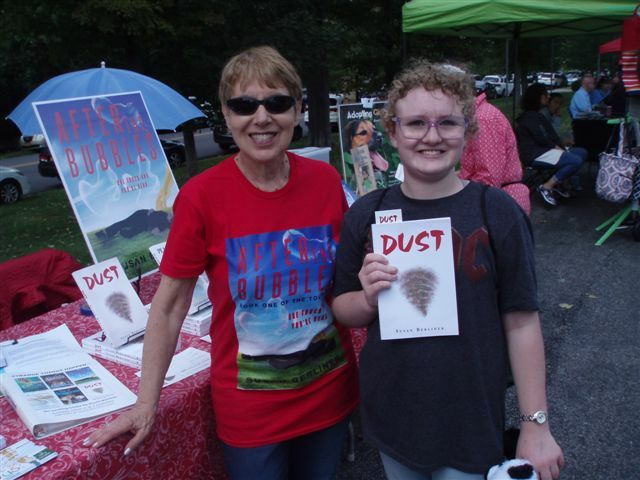 Jo-Ann chose an autographed copy of DUST. Margaret loves time travel so she decided to read The Disappearance. Jack, seems to be showing an early interest in books. and, for a real online shopping experience, I gave bookmarks to customers on line! The weather was perfect: about 70 degrees, sunny, with little wind. My sign stayed upright until the last hour. Nancy intends to read The Disappearance on her upcoming vacation. and decided she wanted a signed copy of the book. John picked up an autographed copy of The Disappearance for himself. Lucille (standing) graciously hosted the event in her condo. ...I discussed the creative writing process and answered questions. 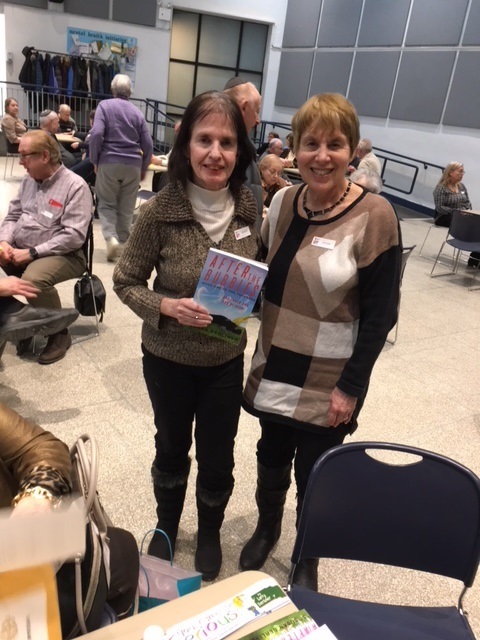 After my talk, Barbara bought a signed copy of DUST and Peachwood Lake. It was a gorgeous day: sunny with very little wind. Most vendors had tents to protect them from the 80+ degrees hot sun. I didn't, but I love the warm weather. 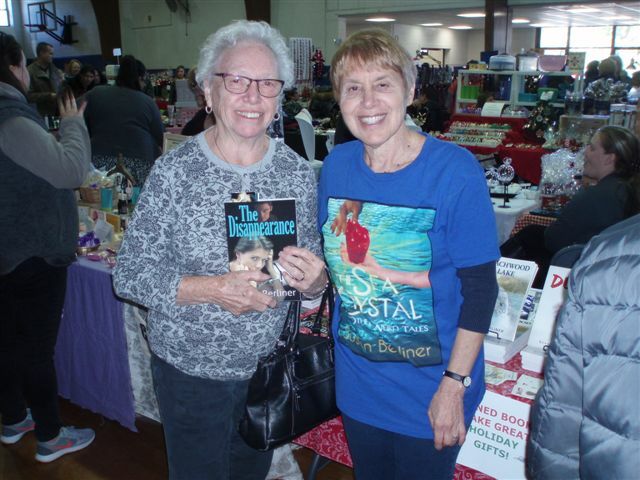 Vilma, an avid reader, purchased a copy of The Disappearance. and the weather was warm and sunny until about 2 pm when the rain came. I signed a copy of The Disappearance for Suzanne's mom, Maxine. about Shirley Temple and dolls. Montrose Business Association Craft Fair in Montrose, NY. Luckily, the weather held up; the predicted rain never materialized. The Fair was set in a grassy area in the business district. Unfortunately, this was the first time for this event and there wasn't much traffic. DUST, Peachwood Lake, and The Disappearance--for his ex-wife. Now that's a nice guy! for the Croton Cortlandt Center for the Arts, which burned to the ground in January. 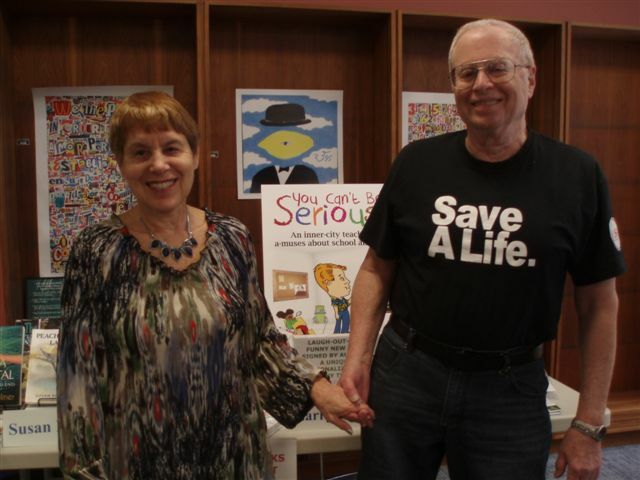 The event was held in the Morabito Community Center in Cortlandt Manor, NY. Alvis purchased signed copies of Peachwood Lake and The Disappearance. Twelve-year-old Julie decided to read Peachwood Lake, which centers around a 13-year-old girl. the same first name as the novel's heroine! Celina also opted for a signed copy of The Disappearance. Mary decided to purchase a copy of DUST for her 15-year-old son. in Mohegan Lake, NY. It's a delightful little eatery--and I had an awesome time! My Child Won't Listen...and other early childhood problems. We used a table in front of the fireplace for our books and posters. It was a very cozy setting! that's more than four hours! Dawn calls me her favorite author; I am so flattered! Dawn purchased a paperback copy of The Disappearance. Like me, Susan is a huge Dean Koontz fan. and a copy of DUST for her 16-year-old son, Nick. Thanks to Lenny & Lonna DiFroscia, owners of Steampunk Coffeehouse, for a most enjoyable afternoon. I recently made my second appearance on George Ondek's TV program. The show will air on Cablevision in Yorktown (Channel 74) on Thursday, May 29 at 8:30 pm - 9:00 pm. The interview was broadcast on Channel 15 in Peekskill in April. I'm on TV again! I'm a guest on "A Modern History of Yorktown," hosted by Ray Arnold. 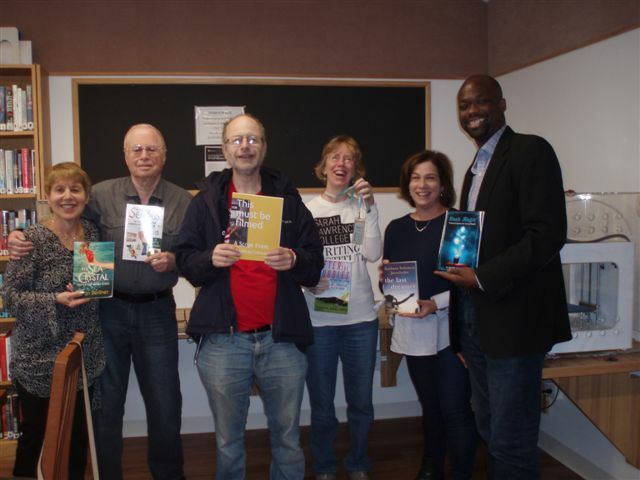 The show airs on Channel 74, Cablevision, in Yorktown (NY),Thursday nights at 9:00.
to members of the Westchester Reading Council at the Rye Library in Rye, NY. and novels during the talk. I passed around copies of news articles about recent dust devil happenings. gave me an engraved mug. Marcy got an autographed copy of DUST for LeLeah, a 11-year-old relative. Karen bought signed copies of DUST and The Disappearance for herself and her dad. at St. Luke's Church in Somers, NY. It was a lovely autumn day--a bit cool, but rain-free and mostly wind-free. This woman purchased a copy of DUST for Kevin, her 14-year-old grandson. The Disappearance, Peachwood Lake, and DUST. Betty decided she wanted to read DUST. and The Disappearance for herself. Barbara chose a signed copy of DUST. handing out bookmarks and signing copies of my novels. as I chatted with book lovers at the Demarche Publishing booth. The Disappearance, Peachwood Lake, and DUST were prominently displayed. ...fellow New York Jets' fan, Nurian, also decided to read Peachwood Lake. 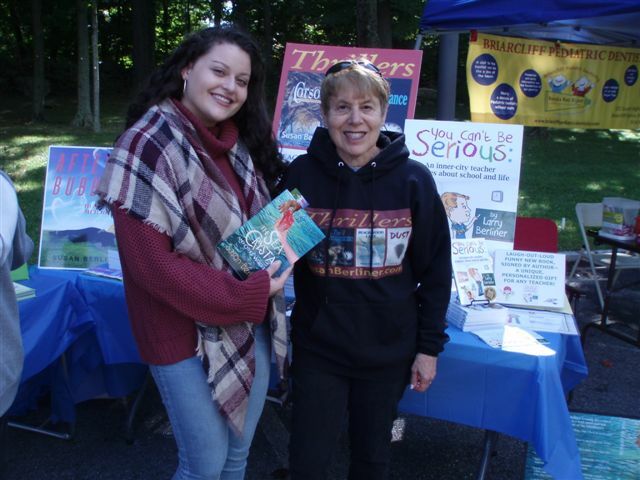 On September 21, I signed copies of my books at Fieldhome's Fall Festival in Cortland Manor, (NY). It was a lovely event with tables lined up around an oval walkway. Although it kept threatening to rain, it never did. they are lost somewhere inside the computer. On September 12, I was interviewed on Karen Pokras Toz's blog. followed by fireworks, but it started pouring before 6 o'clock. It was a gorgeous park setting. Note the Hudson River in the background. displayed vertically and my poster is balanced on the ground. But check out my tee shirt, a terrific birthday gift from my daughter. Cortlandt's 225th anniversary celebration. Behind them are the drums and bugles. 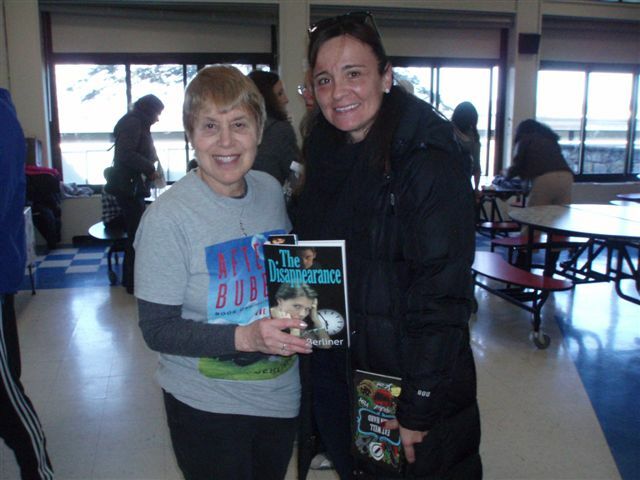 It was a book signing event--and I autographed a copy of The Disappearance for Rebecca. 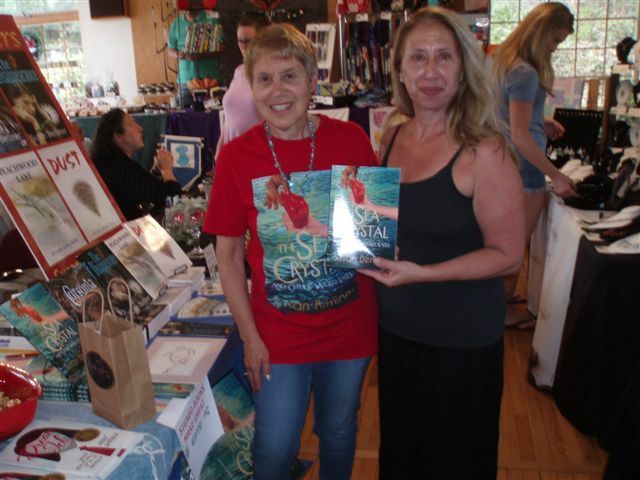 On July 11, I had a book signing at Kirby's Grill and Bar in Yorktown Heights, NY. 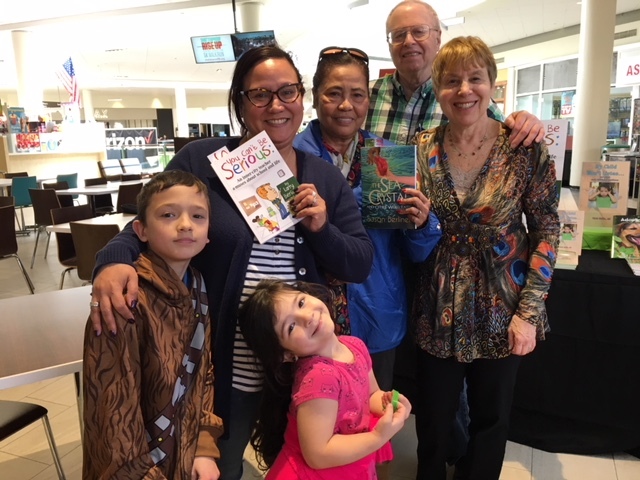 the new childrren's book, Adopting Ginger, which Iliana Weinbaum (center) illustrated. Here's my table. We were in the restaurant's back room. Fourteen-year-old Iliana decided to read The Disappearance and Peachwood Lake. On June 19, I was interviewed about my novels on George Ondek's cable TV show, "Get On Deck." and in Peekskill (Channel 15). You can see it here. I was only the second author George has interviewed on his TV show. Since he's done more than 600 shows, that's quite an honor! and I hope everyone enjoys watching it. 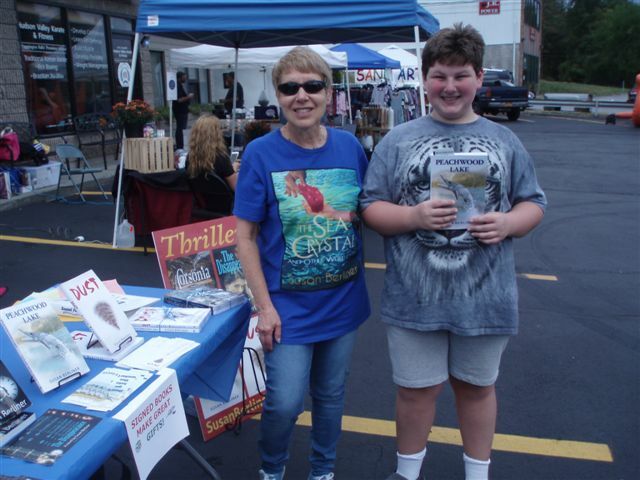 On June 15, I signed copies of my novels at a "Bagels & Books" event at JV Hot Bagels in Jefferson Valley, NY. As always, the bagels were delicious and the line often extended out the door. giving new meaning to the concept of advertising on-line! with the temperature in the low 70s. Bob was my first customer. He bought a signed copy of The Disappearance for his mom. Thirteen-year-old Danielle decided she wanted to read DUST. Shannon plans to read The Disappearance when she vacations at the Jersey shore. Kevin purchased two of my novels: The Disappearance and DUST. Ray and his wife plan to read The Disappearance. 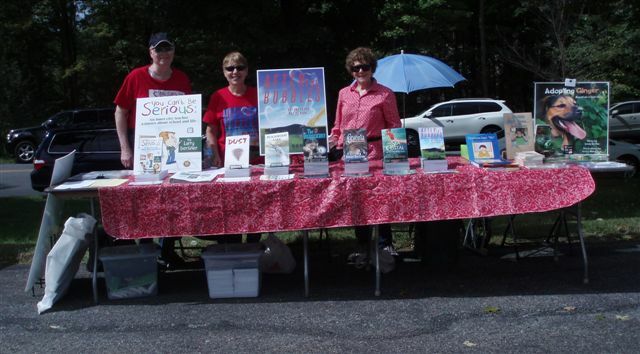 On June 1, I participated in Yorktown (NY) Community Day. Proceeds from vendor fees benefitted two local youth organizations: ASK and DARE. It was a beautiful sunny day--but very hot, with the temperature reaching 90. I am holding my poster because the wind kept knocking it over. The bungee cord idea didn't work. Rob bought The Disappearance and his 11-year-old twins Chase and Jake chose Peachwood Lake and DUST. George Ondek, a local TV host, invited me to be a guest on his cable TV show. What do you think I said? "Yes," of course! We had a super location near the entrance. Unfortunately, the store wasn't very busy Friday night. Larry chose DUST and Nancy wanted to read The Disappearance. 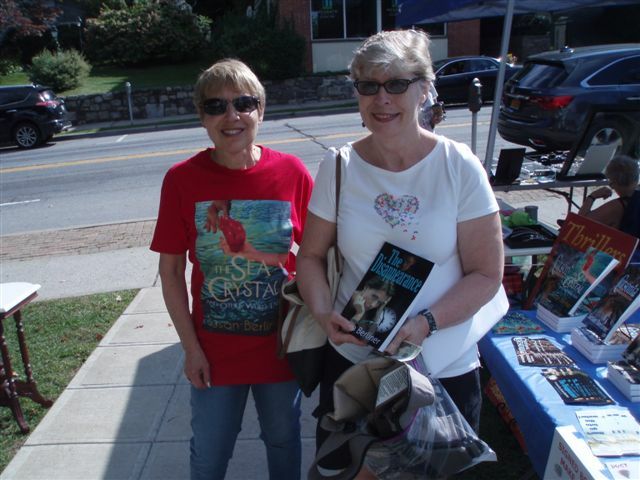 On May 11, I signed copies of my novels at Bethel's Mother's Day Marketplace in Croton-on-Hudson, NY. and other early childhood problems and the new children's book, Adopting Ginger. We call our events YIKES! & TYKES. Michael's aunt thought her 16-year-old nephew would enjoy reading the time travel thriller, The Disappearance. Marge also chose a signed copy of The Disappearance. On May 13, from 7:30 - 8 pm, I was the featured guest on "Let's Talk Writing,"
a TV show that aired on (Comcast) Channel 8 in Putnam County, NY. 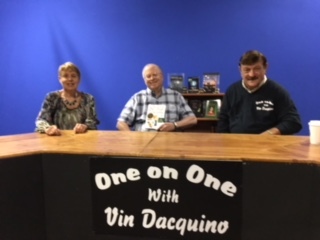 "Let's Talk Writing" is hosted by author Vinny Dacquino, who heads a local writers' group. so the cover doesn't create a glare on camera. Three robotic-looking cameras are used to film the show. I tried to focus on Vinny--not the cameras. This photo appeared in black & white on p.7 of the March 19th edition of the Northern Westchester Examiner. It was taken at the Tea Temptations book signing (see pictures below). 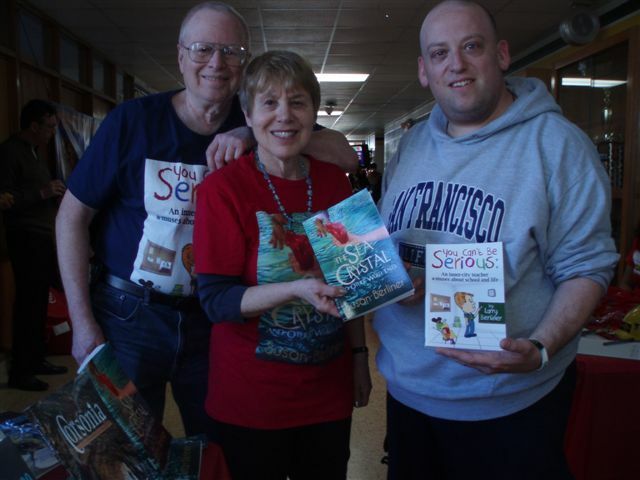 With me are fellow author, Linda Griffin, and Tea Temptations owner, Mike Adamovich. This was a YIKES! & TYKES event so I shared a table with Linda Griffin, author of the parenting book, My Child Won't Listen...and other early childhood problems and the new children's book, Adopting Ginger. Tea Temptations owner Mike Adamovich got a signed copy of The Disappearance for his daughter. 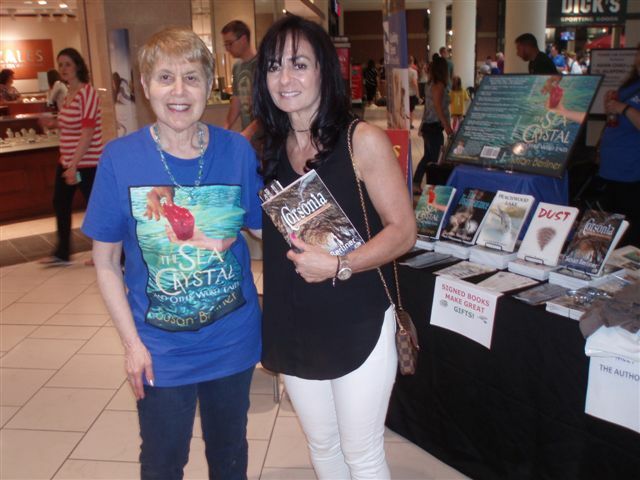 Dotty purchased three copies each of DUST, Peachwood Lake, and The Disappearance for family and friends. Twelve-year-old Annabelle decided to read Peachwood Lake, which features a 13-year-old heroine. Smile! 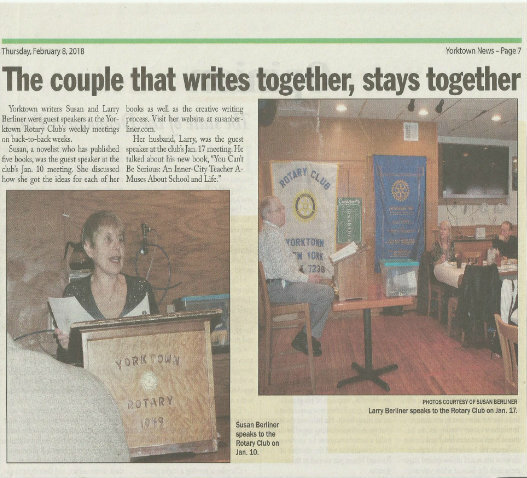 Stan Gitner took a photo of Linda, me, and our table for the local newspaper, The Examiner. Suesan, an avid reader, told me she always checks the first two paragraphs of a novel to see it grabs her attention. Then she bought all three of my books! Fifteen-year-old Seattle chose signed copies of Peachwood Lake and The Disappearance. 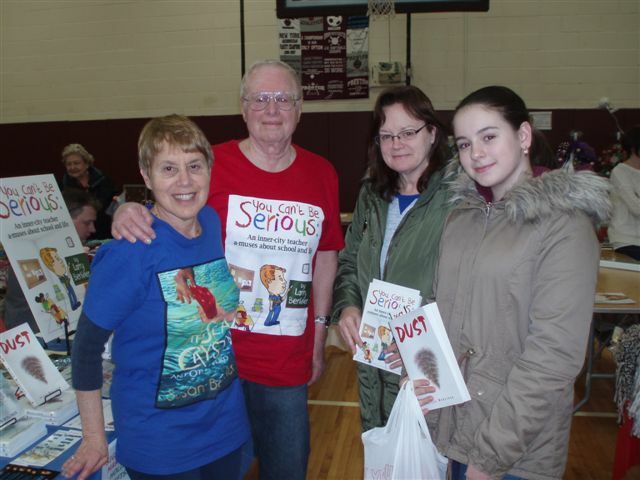 We each had a large table to showcase our books. Then each author gave a short talk about his or her books. ...and we signed copies of our books. 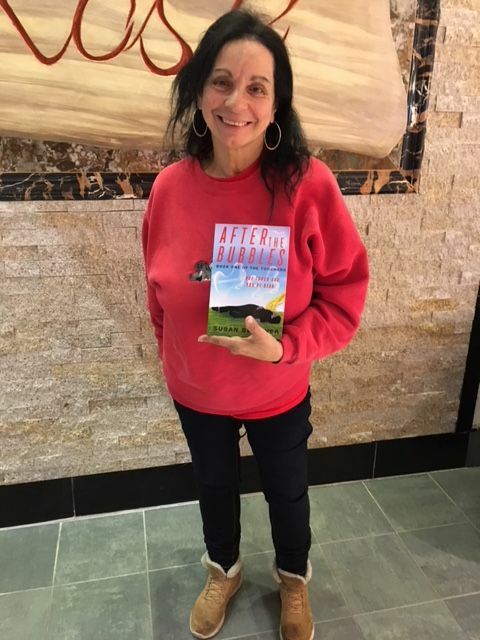 Patricia purchased a copy of The Disappearance. Joanne Powers, recreation director of Drum Hill, arranged the event. I spoke about how I got the ideas for each of my novels: DUST, Peachwood Lake, and The Disappearance. 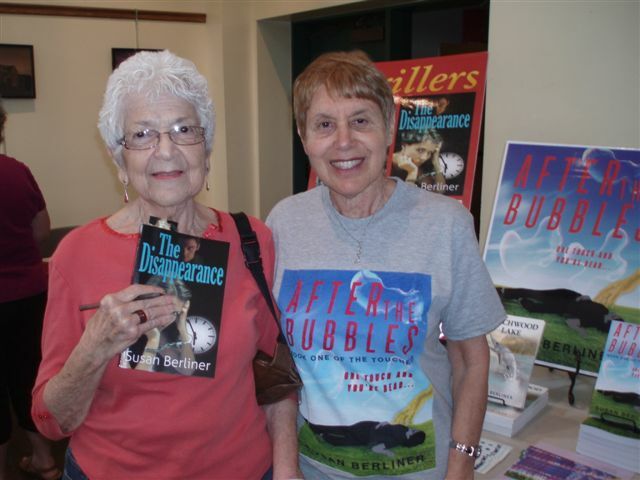 Diane, the receptionist--and a time travel fan--purchased a copy of The Disappearance. ...and Margaret and Bob, two more of my prize students, chose The Disappearance. Olivia purchased my fish story, Peachwood Lake. 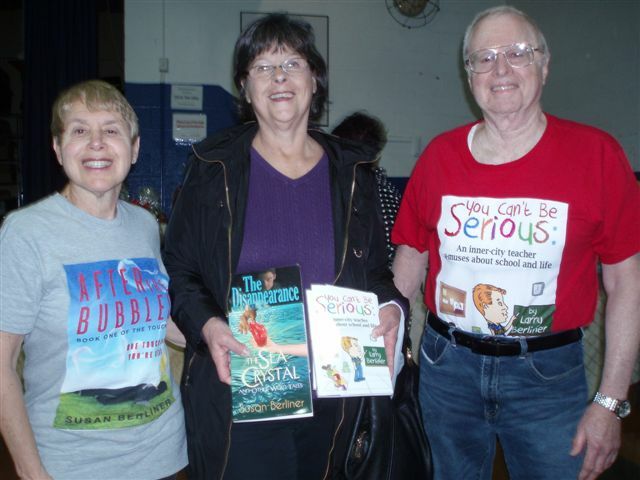 On December 2, I had a book signing event at Bethel Springvale Inn's Holiday Fair in Croton-on-Hudson, NY. I shared a table with Linda Griffin, author of the parenting book My Child Won't Listen...and other early childhood problems. We call our joint signing events, YIKES! & TYKES. ...and I signed a copy of The Disappearance for Judy. 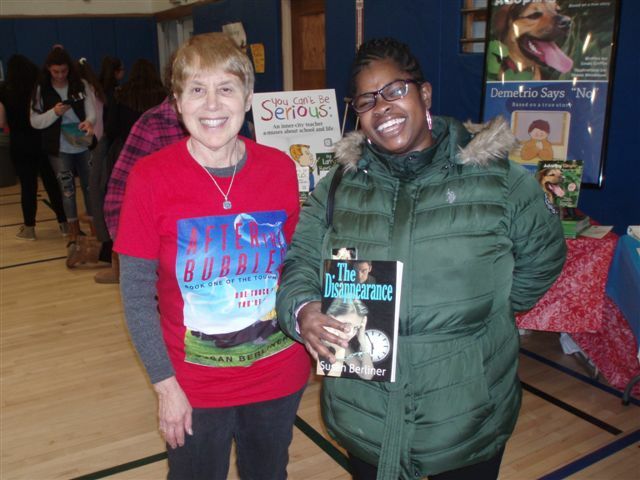 Marsha, housing coordinator for Bethel's The Pines facility, bought a copy of DUST. Amanda, a young published poet--and a fan of time travel thrillers--purchased The Disappearance. 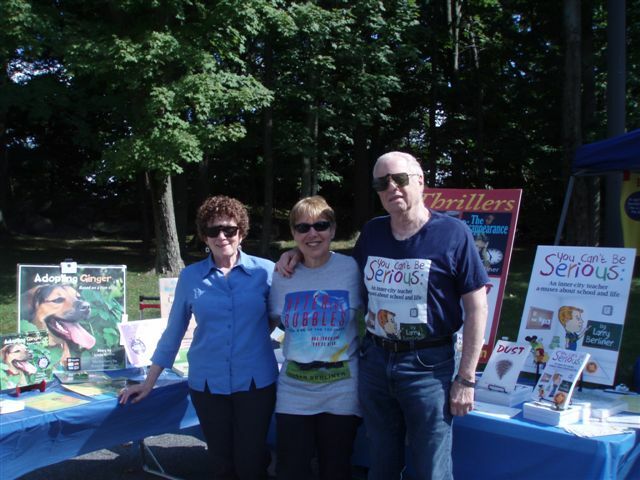 On October 20--a gorgeous fall day--I signed copies of my novels at Saint Luke's Church's Harvest Festival in Somers, NY. I shared a space with Linda Griffin, author of the parenting book, My Child Won't Listen...and other early childhood problems. We call our joint signing events, YIKES! & TYKES. 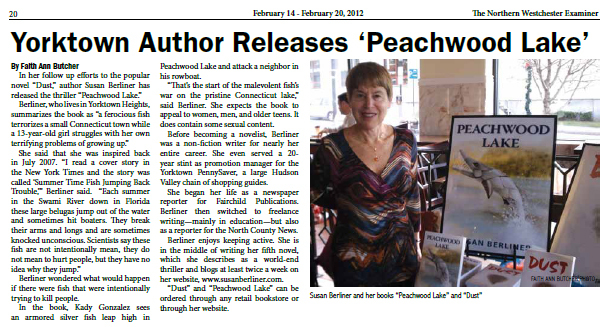 ...and Diane bought a signed copy of Peachwood Lake for her friend who lives on Peach Lake. But Olive the parrot thought my books were for the birds. 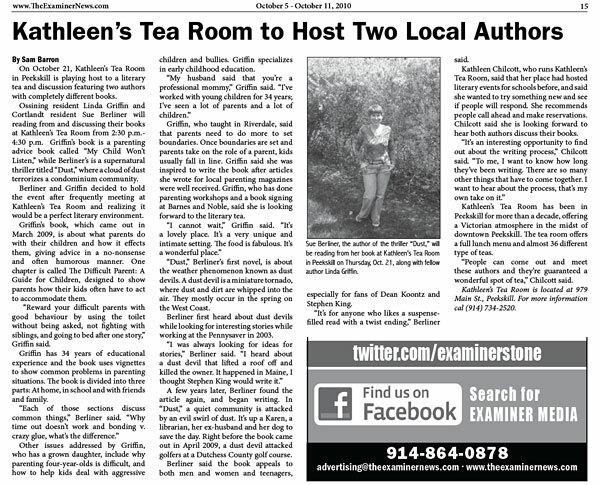 An article about me and my novels ran in the October 17 edition of the Yorktown Daily Voice. For a change, it was a beautiful day for a book fair--sunny, warm, with no wind. This school librarian purchased Peachwood Lake for her students. Barbara wanted a signed copy of DUST. I explained what my novels were about to many book lovers, including this young woman. Chris Angel purchased a copy of DUST. 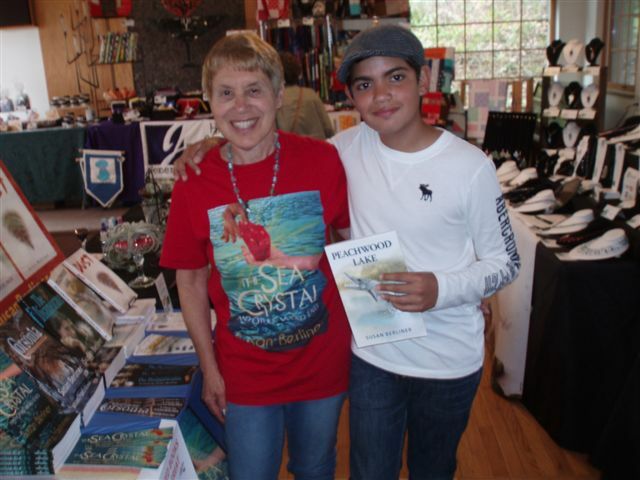 Aloma returned to the booth to get a signed copy of Peachwood Lake. This teacher purchased DUST for her eighth grade class. 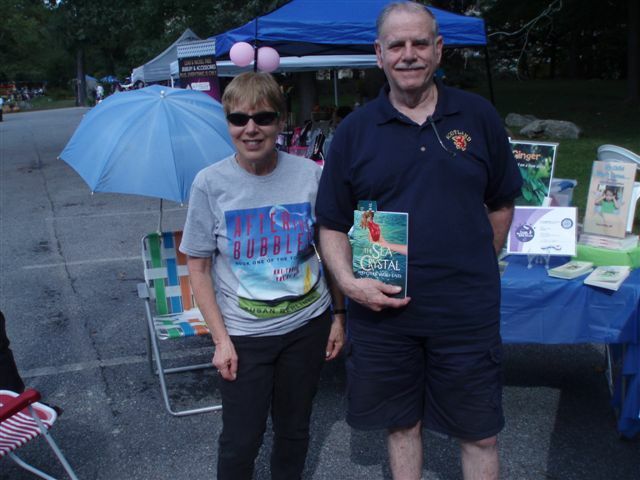 On September 22, I participated in Fieldhome's Fall Festival in Cortlandt (NY), signing copies of DUST and Peachwood Lake. It was a mostly cloudy--and windy--day. Notice I'm holding both of my book posters. but it seems little Miller is anxious to read the novel. Jessie, an avid reader, bought both DUST and Peachwood Lake. Even Dora is a Peachwood Lake fan! Connor, 13, and Amber, 10, both decided they wanted to read DUST. a wonderful Yorktown Charity that raises money to battle breast and ovarian cancer. 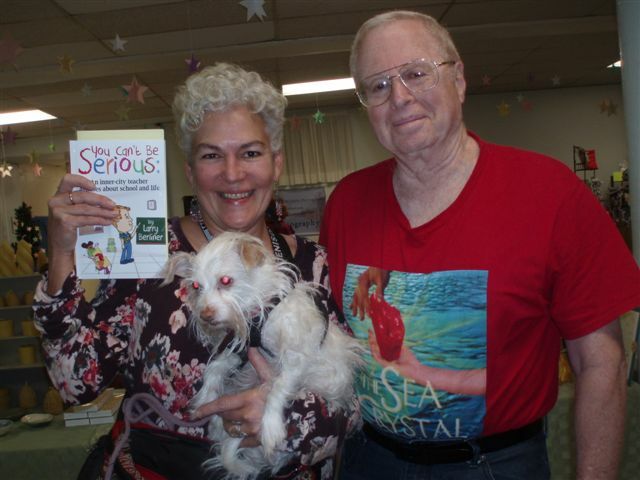 On September 8, I had a YIKES & TYKES book signing event (Grandparent's Day Marketplace) at Bethel - The Pines, a seniors' facility in Ossining, NY with Linda Griffin, author of the parenting book, My Child Won't Listen...and other early childhood problems. It was a rain or shine event. Unfortunately, there was much more rain than shine--but the event remained outdoors. ...and, when we moved inside, Dorothy purchased a signed copy of DUST. How appropriate! Dorothy is now my oldest reader: She's 100 years young! 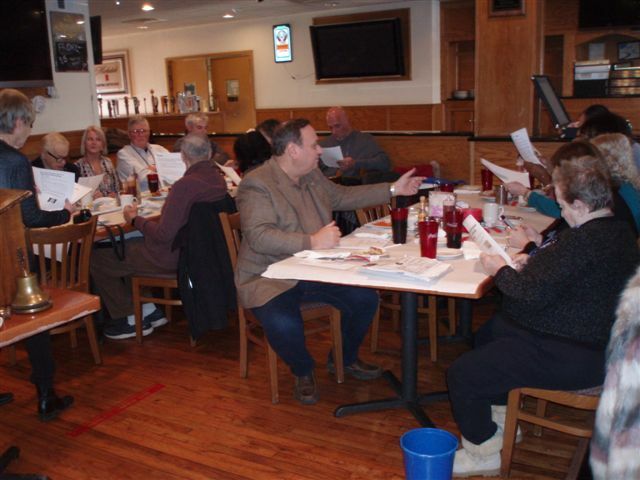 Nearly 20 men and women attended the first class--and many were terrific, talented, and experienced writers. ...and each person wrote a description about one of the settings. Some volunteered to read their work aloud. Joanne Powers, recreation director for Drum Hill, invited me to teach the creative writing course. Thanks, Joanne! I used a mike to make it easier for the residents to hear me. I talked about how I got the ideas for DUST and Peachwood Lake and discussed the creative writing process. As you can see, I spoke in the dining room. They served an assortment of pastries, including custard-filled chocolate donuts--my favorite! 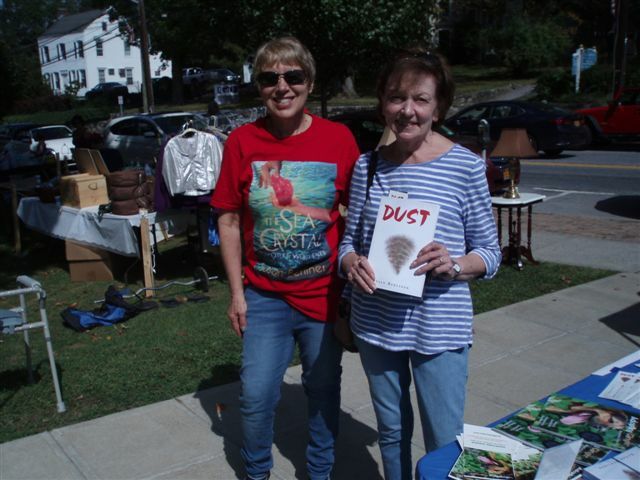 ...Erika, who works with The Seabury residents, purchased a signed copy of DUST. On June 16, I brought my books to JV Hot Bagels in Jefferson Valley, NY. 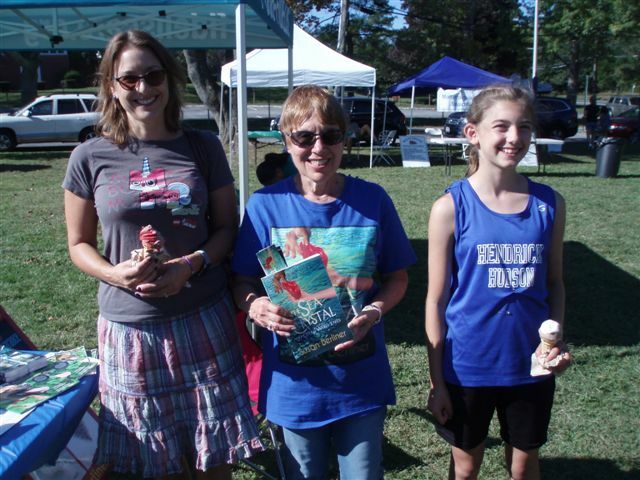 The weather was perfect, the bagels were delicious--and, of course, I signed copies of DUST and Peachwood Lake! I handed out bookmarks to customers to read while they waited to buy food--giving new meaning to the concept of advertising on-line! 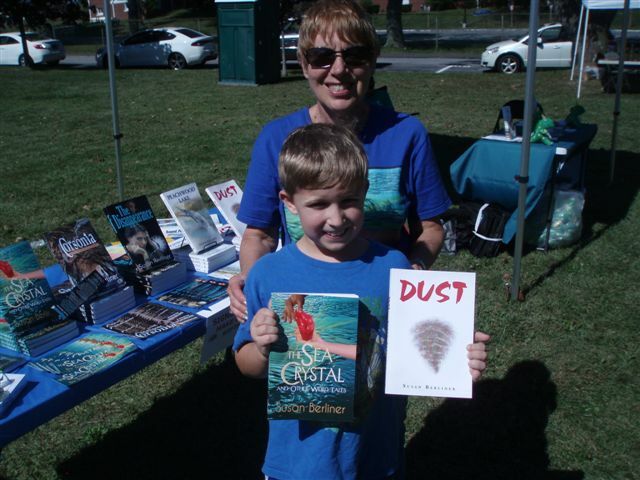 Christopher is an avid reader--and his mom thought he would enjoy DUST. ...and this dad is encouraging his 14-year-old son to read so he purchased a copy of DUST. 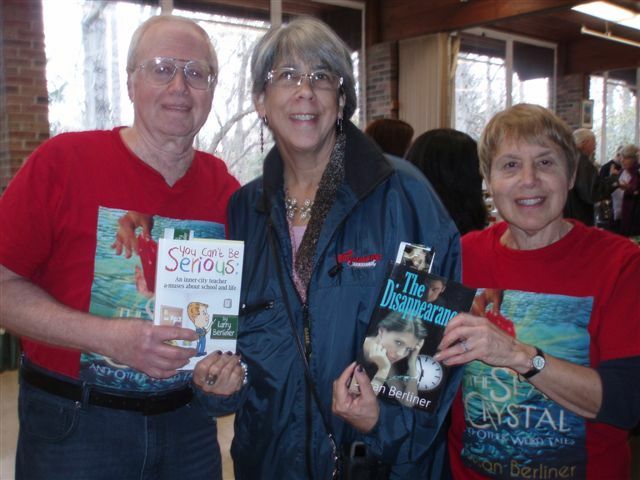 Newspaper publisher, Sandra, bought Peachwood Lake and DUST to read on her trip to South Carolina. 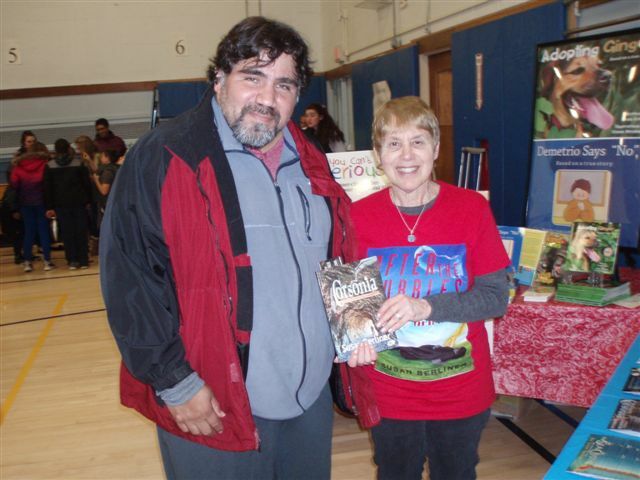 Awilda, a lover of sci-fi and fantasy, was thrilled to find novels in her favorite genre. 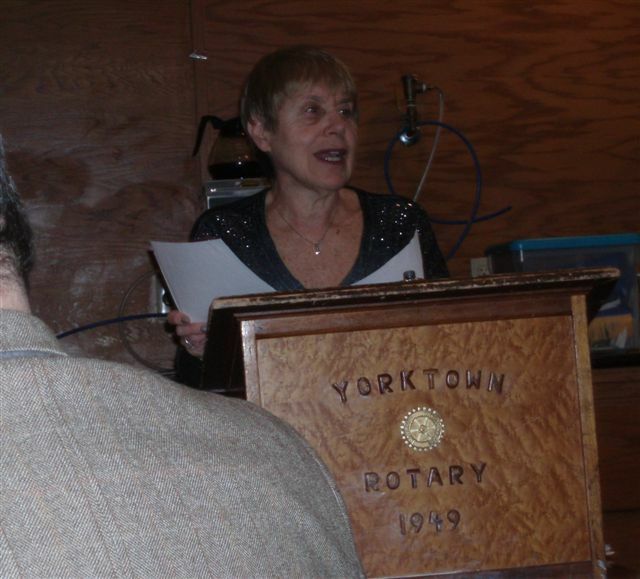 On May 30, I was a guest speaker at the Yorktown Rotary Club's weekly luncheon meeting at Kirby's Grill and Bar in Yorktown Heights, NY. As always, it was wonderful to talk about my novels--and the Rotary members asked insightful questions. The Rotary Club banners adorned the wall of the restaurant. I spoke about how I got the ideas for both DUST and Peachwood Lake. ...I signed copies of DUST and Peachwood Lake for Glyn. 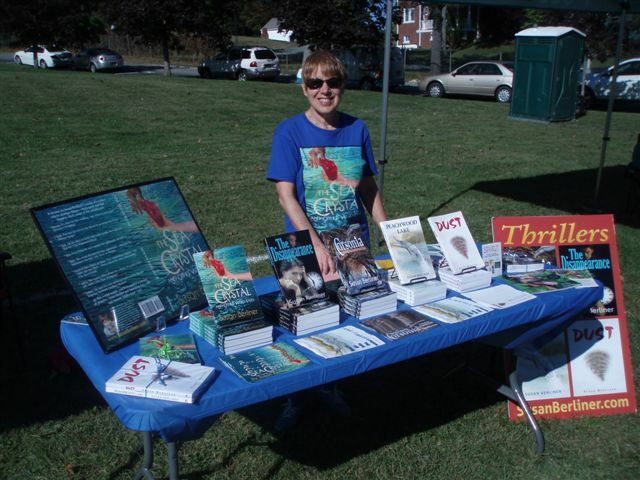 With my books, posters, bookmarks and flyers, I was ready to greet visitors. Dario Gristina, a candidate in the upcoming New York State Assembly primary, was my first customer. Since he loves supernatural thrillers, Dario purchased both novels. Even Elmo loves DUST and Peachwood Lake! Lonna treated herself to a copy of DUST for Mother's Day. Alexandra had seen DUST in last week's middle-school book fair, but had run out of money--so Mom bought the book for her at Community Day. 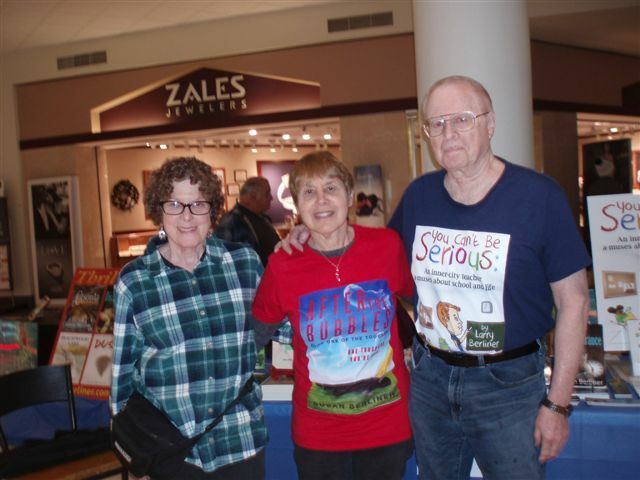 Barbara described herself as an avid reader and book "collector." I signed copies of DUST and Peachwood Lake for her. Emily's mom thought both she and her 13-year-old daughter would enjoy Peachwood Lake's coming-of-age/horror story. When we arrived for our book signing, the restaurant had already set up a double table, attractive tablecloth, and chairs for us. All we had to add were our papers, posters, and books. Linda Griffin is the author of the parenting book, My Child Won't Listen...and other early childhood problems. We call our signing events, YIKES! & TYKES. 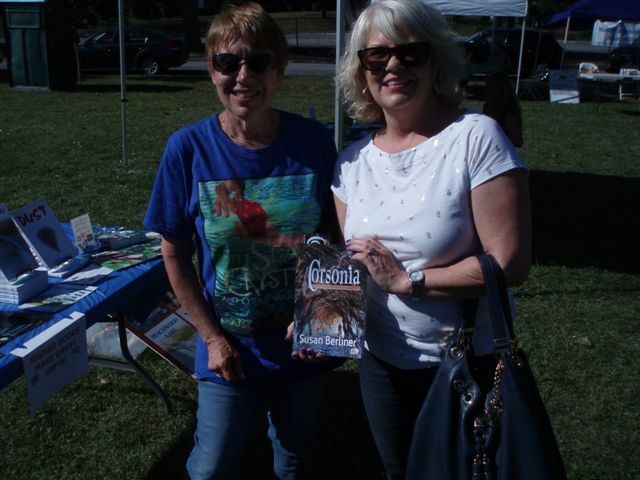 I signed a copy of Peachwood Lake for Marsha, who had already read the thriller and loved it. Sonya purchased a copy of Peachwood Lake because she's Hispanic--and so is the novel's main character, Kady Gonzalez. 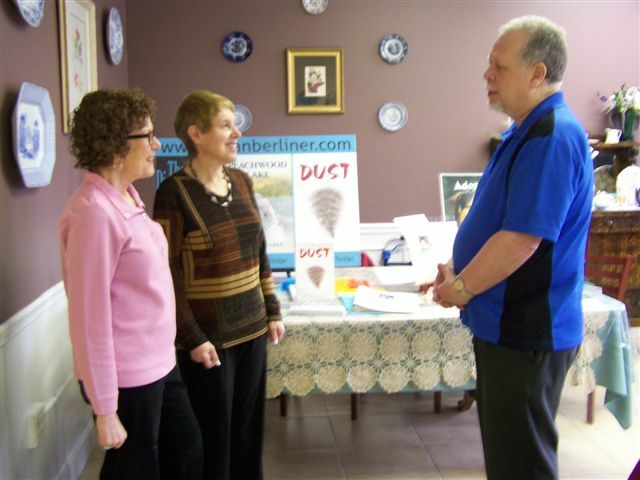 On April 14, I gave a talk about DUST and Peachwood Lake at the Hart Library in Shrub Oak, NY. I discussed how I got the idea for each book, the writing process, plus my publishing experiences. I had a great time--and hope the audience did too. I had my books and notes at the lectern. The audience included readers of all ages. I spoke for about thirty minutes and then answered lots of questions about writing fiction and publishing books. Several people took notes--potential novelists, maybe? When the talk was over, this man told me he had always wanted to write a book, but never had the time while he was working. Now that he had retired, he hoped to find the time to write. 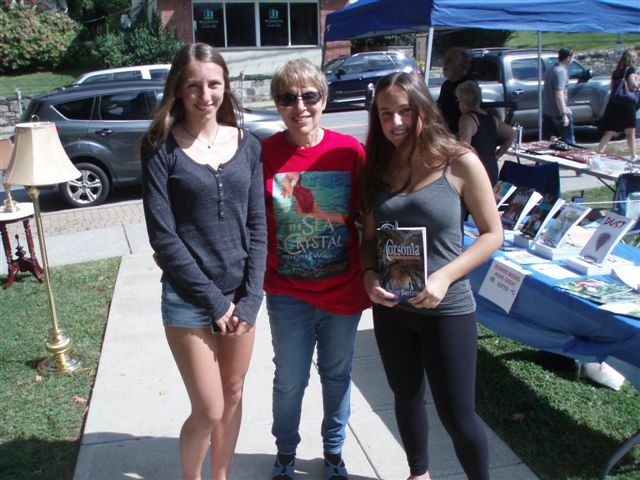 Celina purchased a signed copy of Peachwood Lake for herself and her family. 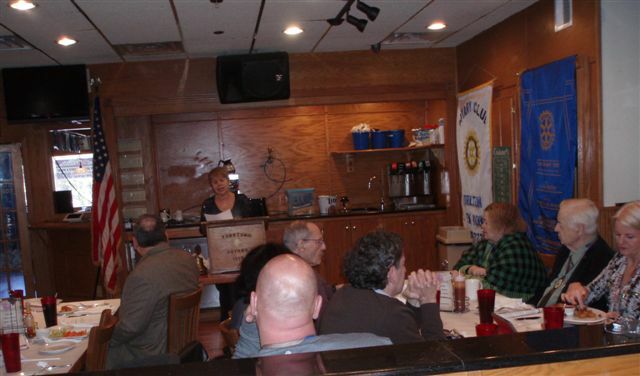 On April 11, I was the guest speaker at the Ossining Rotary Club's weekly meeting at the Tuscan Grille in Briarcliff Manor, NY. ...about how I got the ideas for both DUST and Peachwood Lake. Rotary Club President, Judy Herguth, presented me with a "Thank You" plaque for speaking to the group. ...and Judy, the president--a Dean Koontz fan--also bought signed copies of both novels. The audience listened to each author's five-minute talk about his or her work. I spoke about how DUST and Peachwood Lake were both inspired by newspaper articles. This woman wanted some advice with the memoir she was writing. I suggested she read my weekly blogs and attend my talk Saturday, April 14 in the Hart Library where I'll be discussing the writing process. The visiting authors weren't allowed to sell books inside the library so we moved outside. 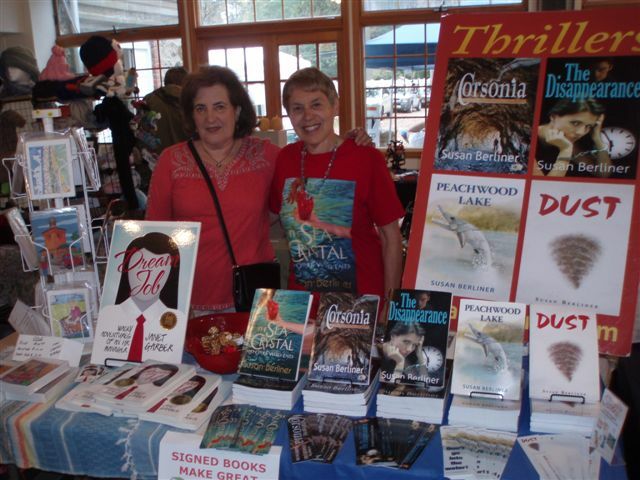 Julia purchased signed copies of both DUST and Peachwood Lake for herself and her mother. With so many participants, table space was tight so I caddy-cornered my display of books, flyers, and bookmarks next to fellow YIKES! & TYKES author, Linda Griffin. Guests roamed around the room talking to the authors and picking up information about all the books. Each author gave a three-minute talk about his or her book(s). 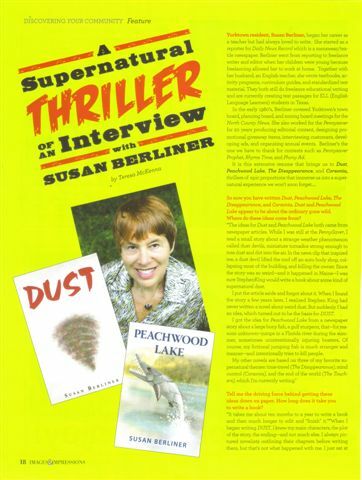 When it was my turn, I spoke about how I got the ideas for DUST and Peachwood Lake from newspaper articles--and that both novels were based on reality. After my talk, in which I explained that DUST was inspired by miniature whirlwinds called dust devils, this man told me he had actually been been enveloped in a dust devil. In this photo, I seem to be doing my own dust devil impression. And, of course, I signed books. Rob bought Peachwood Lake for his mother, who had read DUST and loved it. 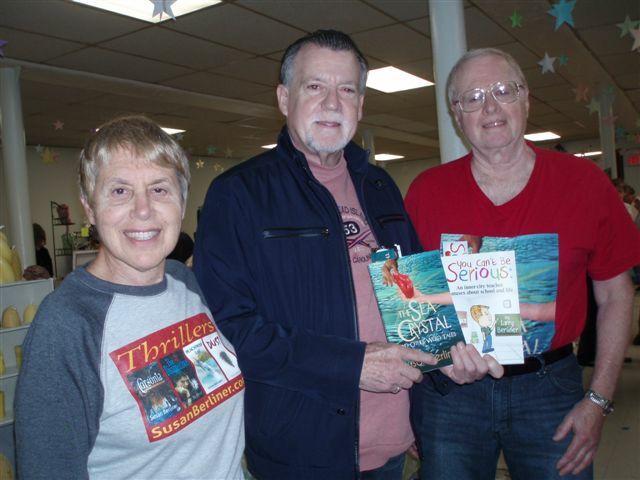 The Club's owner, Mr. Santucci, stopped at our table and purchased our books. This man bought a signed copy of Peachwood Lake for his teenage granddaughter. Ted wanted Peachwood Lake for himself and for his teenage son. Mike also wanted a signed copy of Peachwood Lake. Linda and I call our two-person events Yikes! & Tykes. Anna bought a copy of DUST for herself and her two children. This man, a local photographer, bought a signed copy of Peachwood Lake. Thirteen-year-old Wendy wanted a signed copy of DUST. (She also wanted to read Peachwood Lake, but it has an R-rated scene). I autographed a copy of DUST for Irene, owner of Village Deli and Cafe--a wonderful place for breakfast or lunch! mostly about my new novel, Peachwood Lake. The interview was broadcast in two parts (on air and online) at 1420 WLNA/1260 WBNR (AM). 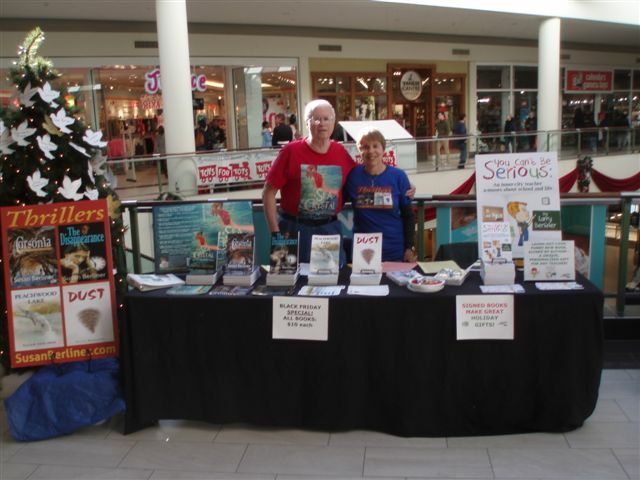 On November 9, I participated in Barnes & Noble's Small Press Expo in Mohegan Lake, NY. 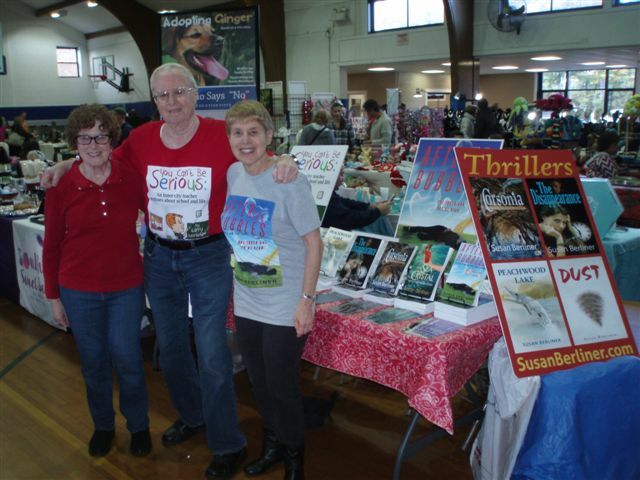 It was great seeing other local authors again. Unfortunately, we didn't see many customers during the mid-week off hours (5 pm - 7 pm). This is my little table display--complete with my poster and colorful "DUST-er." This woman bought DUST for her older daughter, a teenager. Notice the huge line all the way out the door as I signed this woman's book. The food in JV Hot Bagels is really excellent! 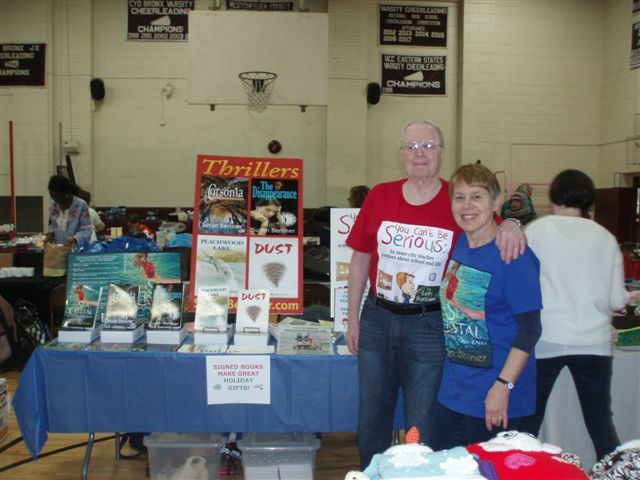 This couple's daughter saw DUST in the middle school book fair last week (see photo below), but thought it would be too scary for her. However, her dad loves supernatural thrillers so he came to see me and buy the book. 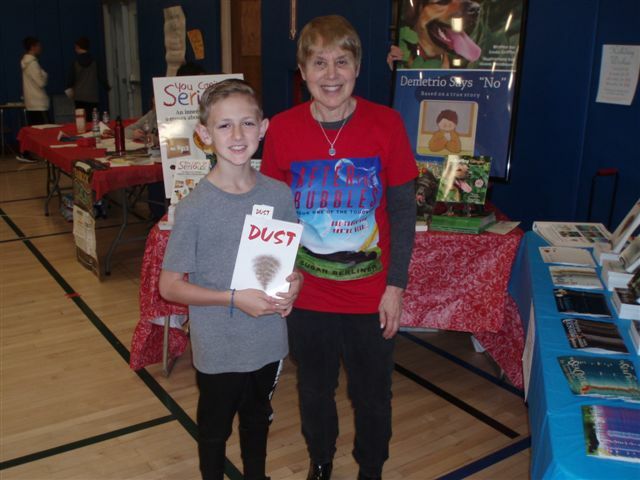 DUST--a great read for teens--has again been included in Lakeland-Copper Beach Middle School's Book Fair (Shrub Oak, NY), running from October 17-21. Here's the DUST display at the school library on Parent Preview Night, October 17. On September 18, I participated in the Brooklyn Book Festival in downtown Brooklyn (NY), signing copies of DUST. 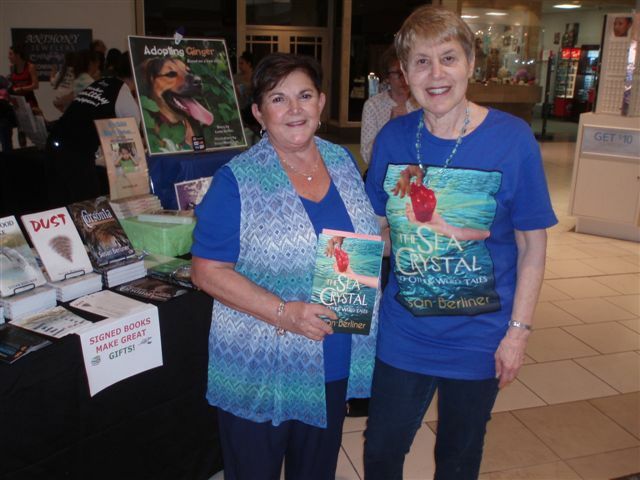 I had a great time introducing the book to new readers and meeting other authors. One question though: Why is it always so windy at my outdoor events? Could my evil dust be responsible? I shared a table with Doris Nieves, author of the novel Misconceptions: Pride and Prejudice: A Conclusion. It was great to meet Facebook friend and fellow writer, Beth Glash, in person and sign a copy of DUST for her. This was the view of the Book Festival from our table. We were in front of the Supreme Court building and next to the subway. Harold told me, if he enjoyed DUST, he would definitely read all my other books. Cesar is 9-years-old, a little young to read DUST by himself, but he wanted a copy of the book so much that his mom promised to read it to him. I signed a copy of DUST for Gina, another fellow writer. Nicolle purchased DUST because she needed a supernatural novel for her extensive book collection. New! Look for signed copies of DUST at Demarche Publishing's table in upcoming book fairs across the United States! 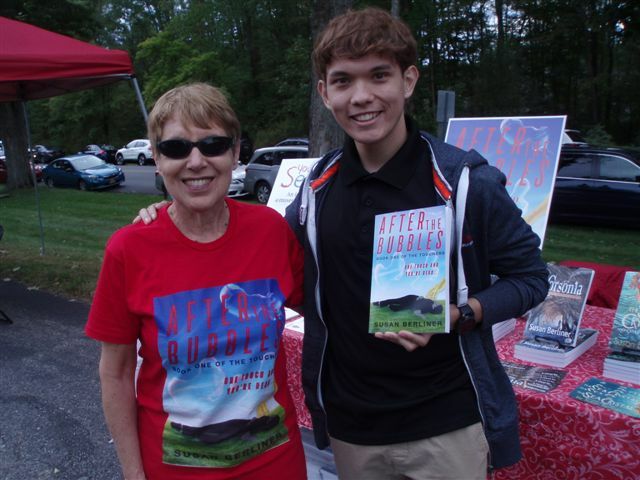 On July 28th, I was interviewed by Janice Lee for her radio program, "Featuring the Arts." The interview aired on WSKV 104.9 FM at 5:30 pm EST and streamed on the Internet. If you missed the broadcast, you can still listen to it here. The sign outside the store announced the event. 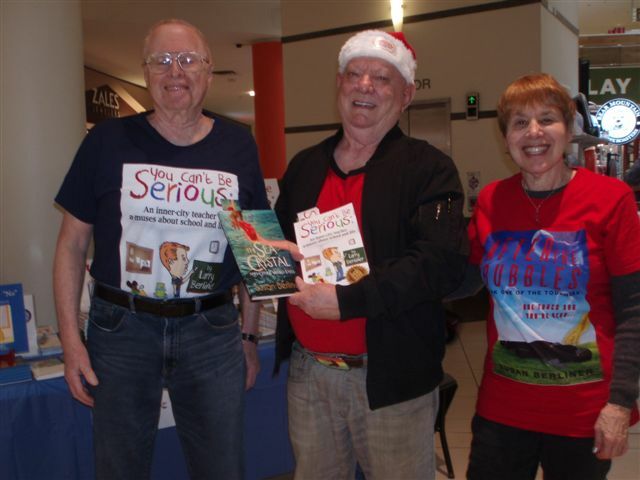 All the local authors shared a line of tables near the front of the store. Here's a view of our book displays on the tables. This teacher was interested in using DUST with her junior high school class. I signed a copy of DUST for this woman's friend. As usual, my table is filled with DUST information. But notice that everything is under plastic because of the pesky rain and drizzle. Here's a view of some of the other tables along Main Street in Ossining. 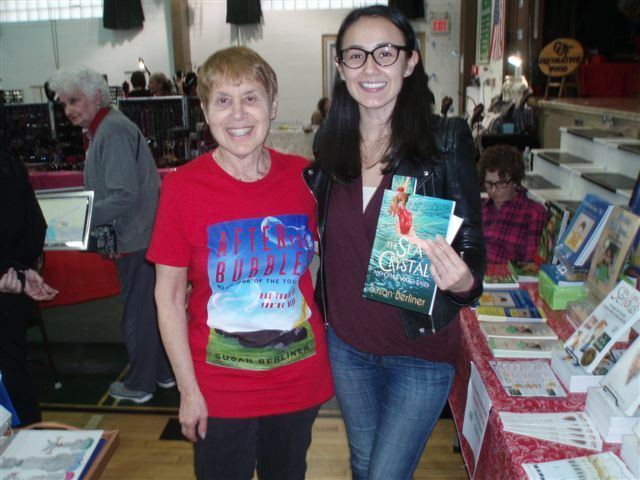 Doris Nieves, author of Misconceptions: Pride and Prejudice: A Conclusion, shared the table with me at the Fair. Our books, and information about them, were neatly displayed on a nearby side table. After our bagels and lox breakfast, Commander Lawrence Kaufman began the meeting. I spoke first, explaining what DUST is about. I also talked about dust devils and passed around copies of newspaper articles about these mini-tornados that are the basis for DUST. Linda Griffin then spoke to the group about her excellent parenting book, My Child Won't Listen...and other early childhood problems. My DUST table is ready for visitors. Here's a view of some nearby tables. I signed a copy of DUST for this woman's daughter. They also ran a week-long DUST trivia contest for a signed copy of the book. Three tables lined up along one side of this cozy cafe showcased DUST and Linda Griffin's book, My Child Won't Listen...and other early childhood problems. Pedro, owner of the Cidade Cafe, made us feel comfortable and welcome. And the delicious pastry-based Portuguese food made us feel wonderful! I signed a copy of DUST for this woman's mother, who was in the hospital. Hopefully, it will help her forget her medical problems. Charlie Cody, a fellow writer and poet, also decided to purchase DUST. Lawrence Kaufman, Commander of Jewish War Veterans' Post 46 in Somers, NY, and Seymour Goldberg, Quartermaster (partially hidden), invited Linda and me to speak to the members of their worthy organization next May. We both readily agreed! I sat in this comfy little couch with my copies of DUST--and my colorful duster. 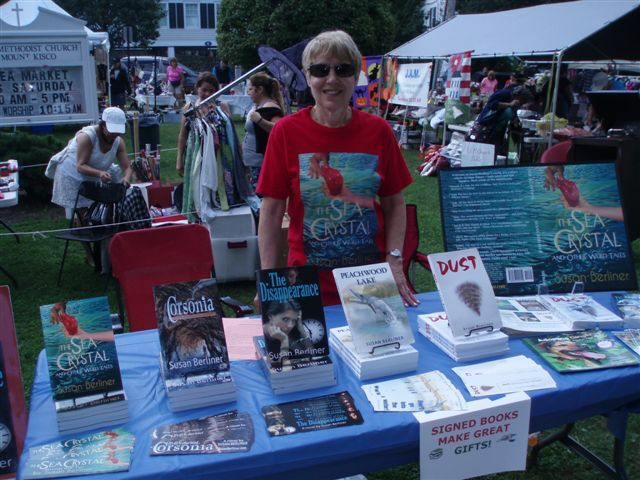 Owner Donna Massaro has helped to promote DUST by displaying the novel and bookmarks. I appreciate it! I signed a copy of DUST for this woman's daughter. It'll make a great Christmas gift! 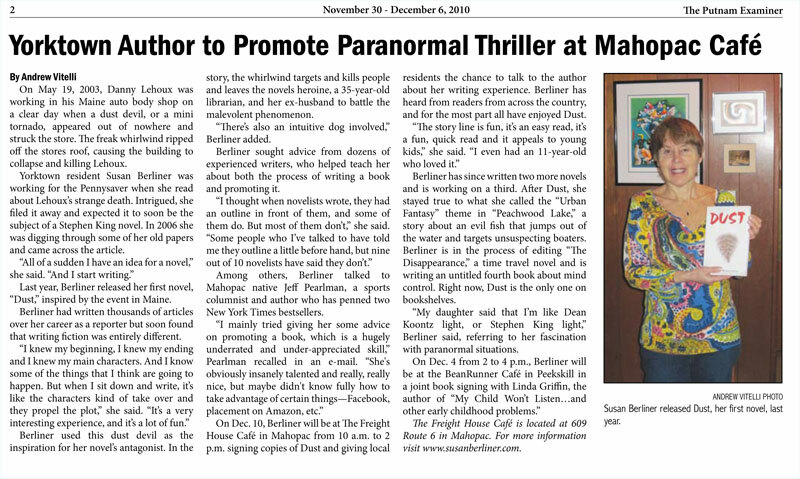 This article from the November 30 edition of the Putnam Examiner mentions two of my December book signing events. 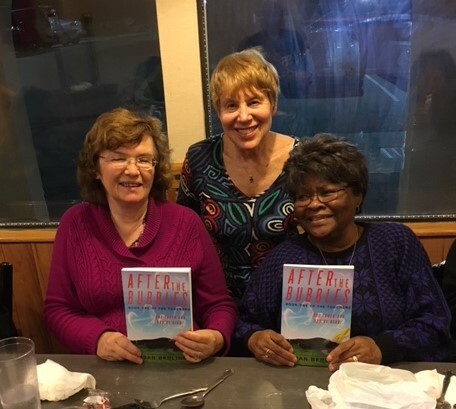 On December 4, I signed copies of DUST at the BeanRunner Cafe in Peekskill, NY with Linda Griffin, author of My Child Won't Listen...and other early childhood problems. We call our two-person events YIKES! & TYKES. We shared a table to showcase our books. Diners were able to watch and listen to us while they ate. ...and so was this woman. This man purchased a copy of DUST. 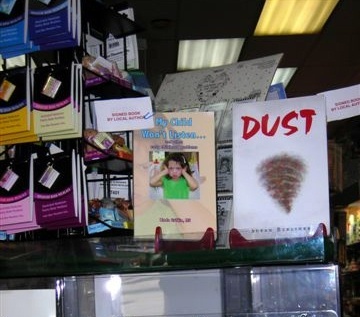 Copies of DUST and My Child Won't Listen...and other early childhood problems are now available for sale at Arcadian Cards & Gifts, 230 South Highland Avenue in Ossining, NY. Stop in and pick up a signed book! Here we are on the counter of Arcadian Cards & Gifts! DUST is appropriate and fun for women, men--and teens. 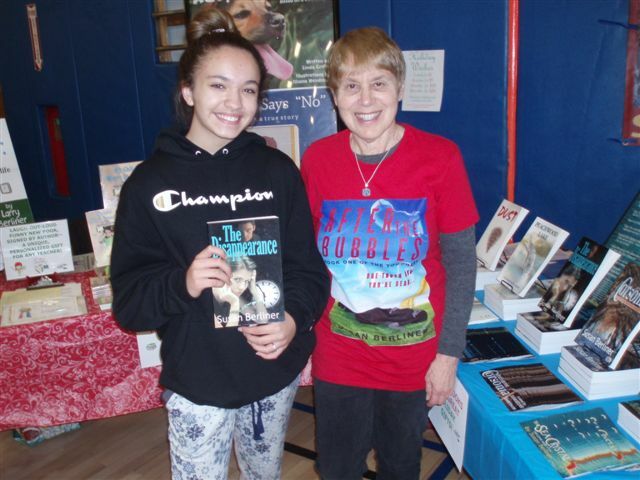 The novel was included in Lakeland-Copper Beach Middle School's Book Fair (Shrub Oak, NY), which ran from October 18-22. Here's a photo of me at the library, after delivering the books to the library for the Fair. Notice the empty display cases. Parents were waiting for a class to end before setting up the books. Our posters publicizing the event are still taped on the front window. 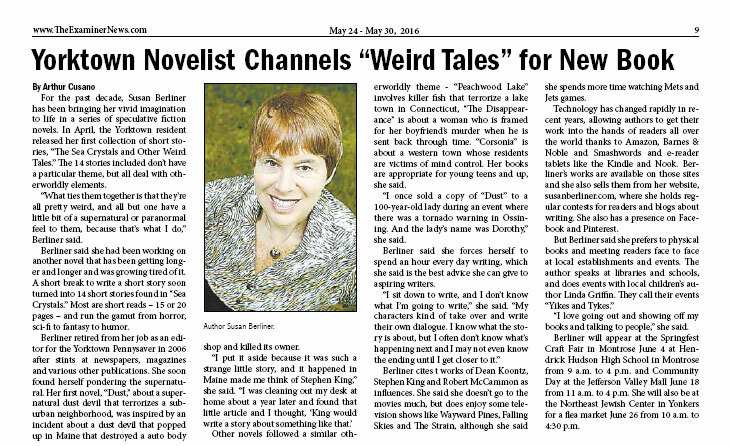 I spoke first, mostly about theweird weather phenomenon that inspired my novel: a dust devil. Linda Griffin talked about her parenting book and read a few humorous examples from the chapter entitled, "The Difficult Parent." 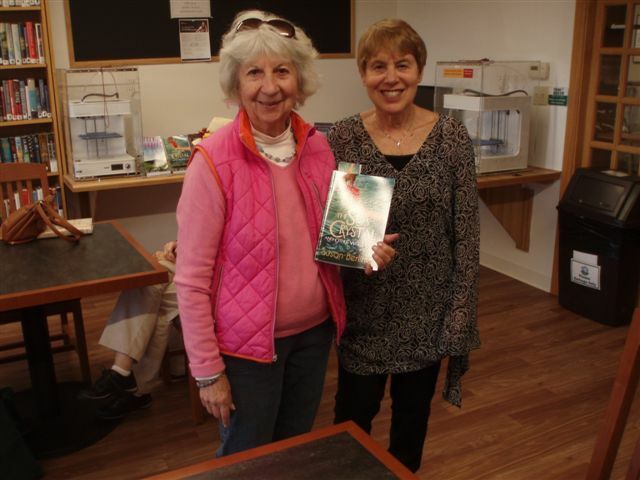 Here I am with Kathleen Chilcott, owner of Kathleen's Tea Room, signing a copy of DUST for her 91-year-old mother. 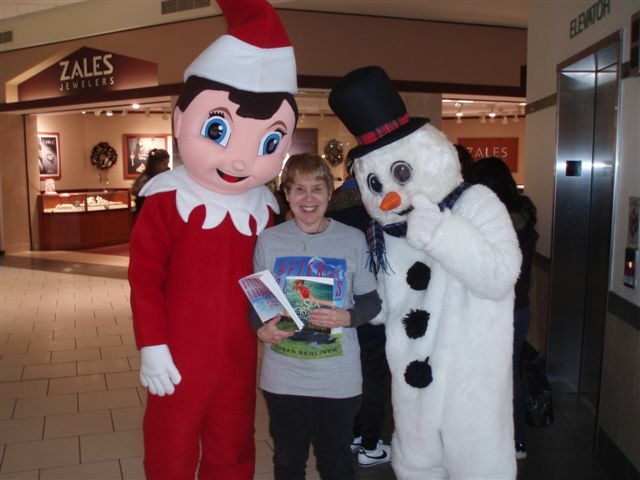 This woman purchased the novel as a Christmas gift--a great idea! For a clearer version of the above article, here's a link to the Yorktown Examiner's archives. As usual, my DUST sign and duster are on display. 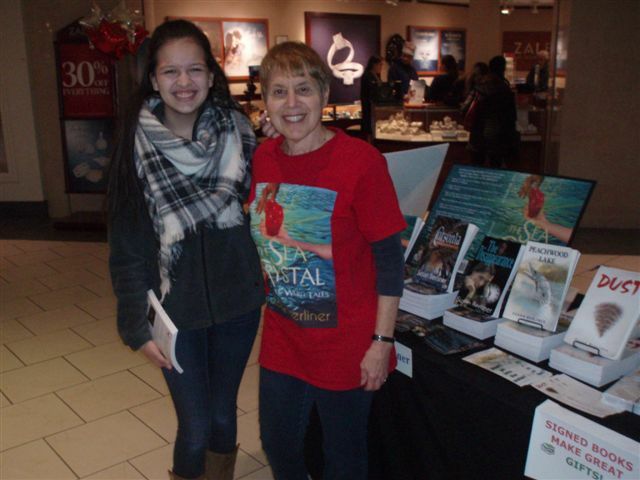 My first customer: a teen reader--and writer! Another young fan of the supernatural purchases a copy of DUST. It's always a pleasure to sign a copy of DUST for a fellow Mets' fan! 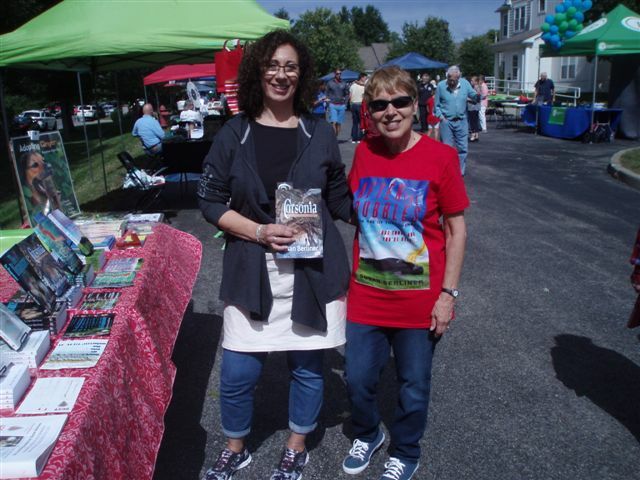 In keeping with the "Locally Grown" theme, I had a mini book signing at the Yorktown Grange Fair in Yorktown, NY (my hometown) on September 11. It was a very mobile experience. Check the photos below and you'll understand. Here's where I began, in the Exhibitor Tent,at a table adjacent to Barnes & Noble, which handled my little event. Unfortunately, no one paid any attention to DUST. Fair goers were more interested in the cooking demonstration thatbegan a few minutes later at the table to the left. Then my table was moved to the center of the tent, opposite Barnes & Noble, and an exhibitor took my former spot next to the cooking table. I was in a space all by myself. Sounds good, right? But only a few people even stopped at the table. This woman was one of the few to visit. Finally, I moved to my final location, behind the Barnes & Noble table--and that spot was much better! Almost immediately, I had my first customer! This man loved signed books--and he added DUST to his collection. And still another as this woman bought DUST for her daughter. Support Connection is a wonderful Yorktown charity that holds events to raise money to battle breast and ovarian cancer. 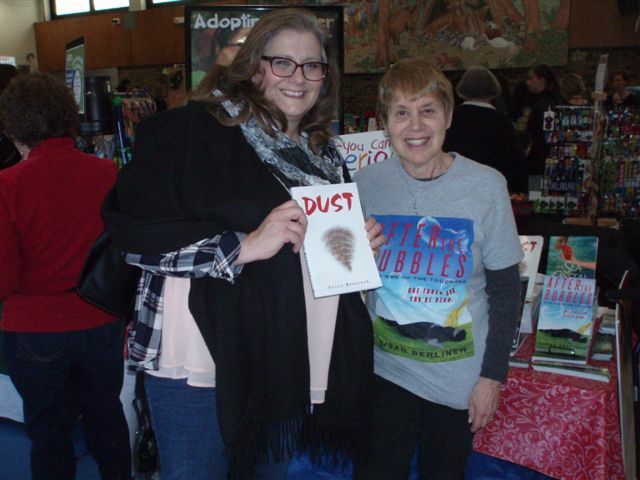 I donated a copy of DUST to Support Connection director, Kathy Quinn, for the organization's upcoming raffle. On August 25, I was interviewed about DUST and my fiction writing by Robyn Murphy on Roboloblyn's Universe of Books for "Writer's Wednesday." 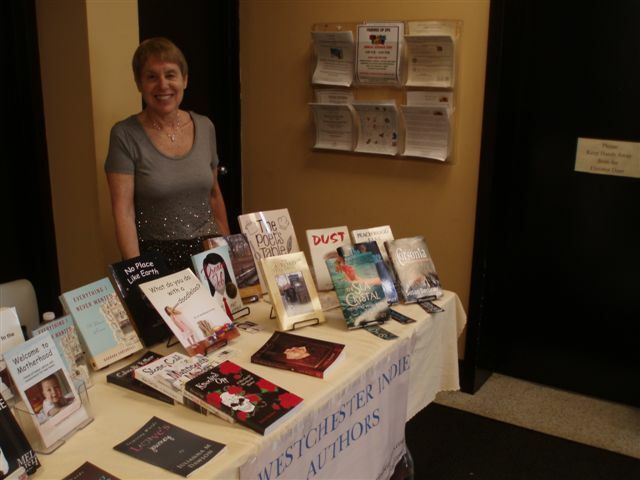 On July 10, I participated in the Inwood Book Fair & Signing at Coogan's Restaurant in upper Manhattan with eight New York area authors--novelists, poets, non-fiction writers, and a photographer. I had a terrific time--and learned a lot about how other authors think and write. Here come the photos! We all sat at a long table with name tags and copies of our books. Many thanks to John & Barbara McMullen for coordinating the event! Here's our author's panel, which John F. McMullen (right) emceed. The other participants included (l.to r.): Stan Trybulski, Amy Holman, George Hopkins, Thomas Wm. Hamilton, me, Paul Levinson, Don Wortzman, and Kathleen Collins. Each of us had five minutes to discuss our books. Of course, I talked about how I got the idea for DUST. People attending the event ate lunch while they listened to our short presentations. Here, Stan Trybulski explains his crime novel series. 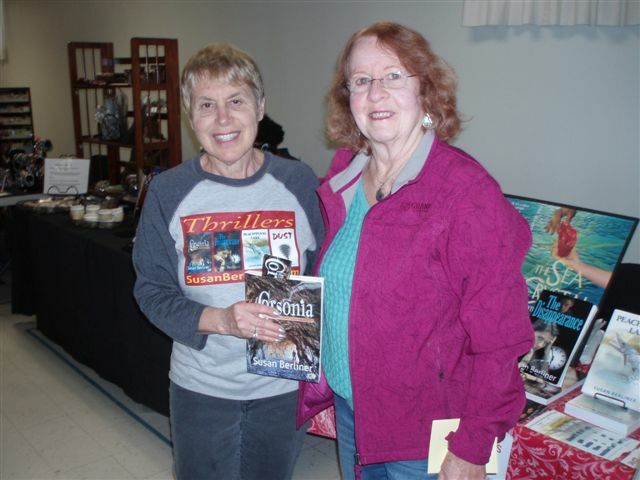 Barbara McMullen (left) expertly handled our book sales. I signed a copy of DUST for a fan of supernatural fiction. 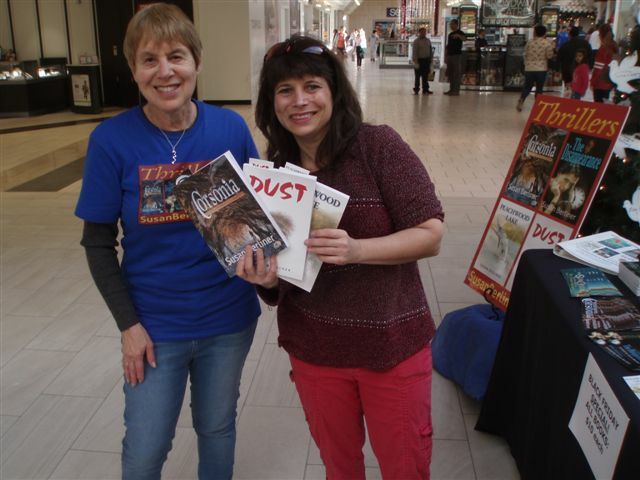 I had a wonderful--but weird--experience signing copies of DUST at Tazza Cafe at the Heritage Hills Shopping Center in Somers, NY on June 17. Almost immediately after I arrived at about 11:30 am, the power went out and remained mostly off until I went to the restroom at 1:30. When I flicked the light switch, that's exactly when the power returned! Do I have (unknown) supernatural abilities? Ask owner Ed Novak, who was with me when I turned the electricity back on. He said the incident gave him goosebumps! Many thanks to Jodee and Ed for letting me have a book signing at their lovely cafe. I had a great time--and the food is terrific too! 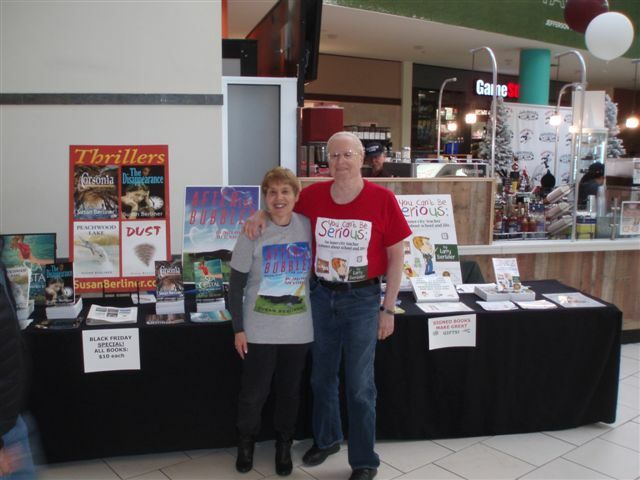 Jodee and Ed Novak promoted DUST in Tazza Cafe and helped to make the book signing a great success. I'm sorry I seemed to disrupt the electricity! As my sign says: Weird things really do happen! Reporter Rich Monetti (left), interviewed me for a story on Patch.com, giving me an opportunity to talk about one of my favorite topics: dust devils. Here, I'm explaining the strange weather phenomenon to Neil, who must have been impressed: He bought a copy of DUST. 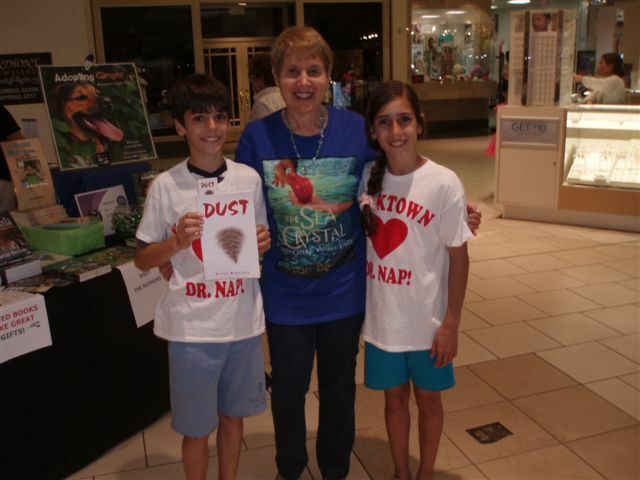 Jodee's mom, Deena, bought copies of DUST for herself and for her grandkids. ...And here's Emily, one of the grandkids, who came into the cafe and received her copy of DUST. Maria bought DUST for herself and her teen daughter. Eileen and Frank came to Tazza Cafe especially for a signed copy of DUST. Gladys was my final customer of the day. The back of the DUST poster is tied to the table with string to keep it from flying away. This girl examines my "DUST" Basket--a raffle prize for a lucky winner. I signed a copy of DUST for this lady. Visitors check out the participating tables. This family showed interest in DUST--and the "DUST" Basket. 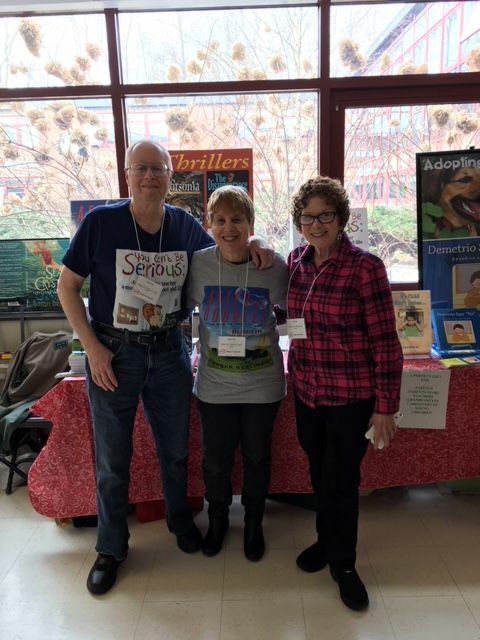 Stacey Ann Beitler, author/illustrator of the children's books Willy Goes to the Farm and Willy Helps a Friend had an adjoining table at the event. And here's the lucky "DUST" Basket Winner: It's Maria DeMartino of Yorktown! I delivered the prize to Maria a few days after the event. Happy DUSTing! Notice the "Welcome" to me on the board. Even though I spoke for the entire second period, the students seemed to be listening. I don't know if they were really interested--or just being polite. This sign in the front of the store promoted the event. 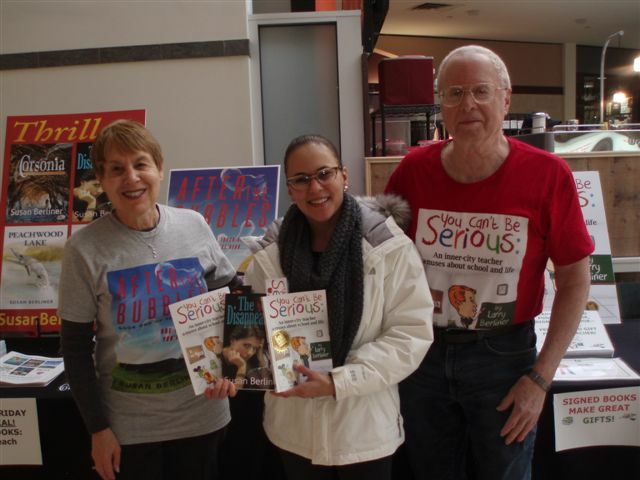 Eighteen authors participated in the event, arranged in nine tables lining the corridor leading to Barnes & Noble. I was at Table 2 at the end of the hall. 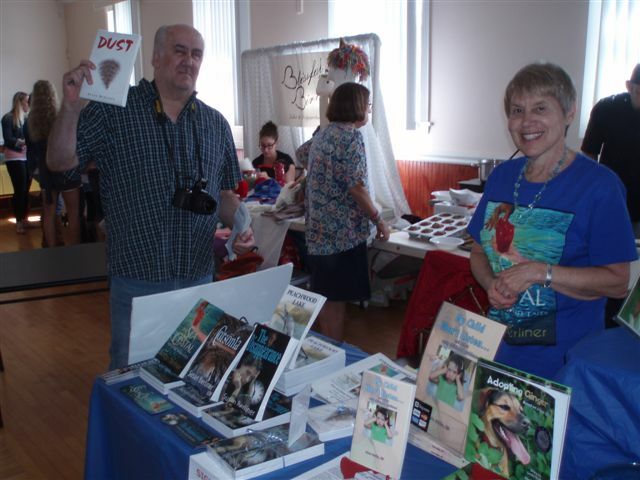 I signed a copy of DUST for this woman who bought many other local authors' books. Both Mom and daughter are looking forward to reading DUST. Racquel Brown Gaston, author of Deadly Instincts, examines DUST. I signed a copy of DUST for Robert Santoro, author of Wrath and Pride, books of the Deadly Sins Series. DUST was a Mother's Day present for this woman's mom. DUST is a great vacation read! Here I am in the library of the Norwegian Gem (with DUST), cruising to Florida and the Bahamas at the end of March. During the cruise, I signed a copy of DUST for Patricia. Happy reading! I discussed how I got the idea for DUST and my writing techniques. Here's another view of the audience. I'm surrounded by new DUST fans. On January 27, I was a guest blogger on Science Fiction & Fantasy Insider, a division of Night Owl Reviews. Read my post on "Characters in Charge" and you can also win a signed copy of DUST! Setting up in the classroom. A family checks out DUST. Some children collected autographs of the participating authors. These kids were buying a copy of DUST--for one of their moms. Signing another copy of the book. I did a "virtual book tour" in November 2009, which included online interviews, guest posts, and reviews of DUST. My itinerary for the month is listed below. I've got my props--DUST poster and colorful duster--and I'm ready for the event to begin. Our 3-author panel (l. to r. - Don Wortzman, me, and John F. McMullen) is set for the library talk. As always, I am making a point about DUST. 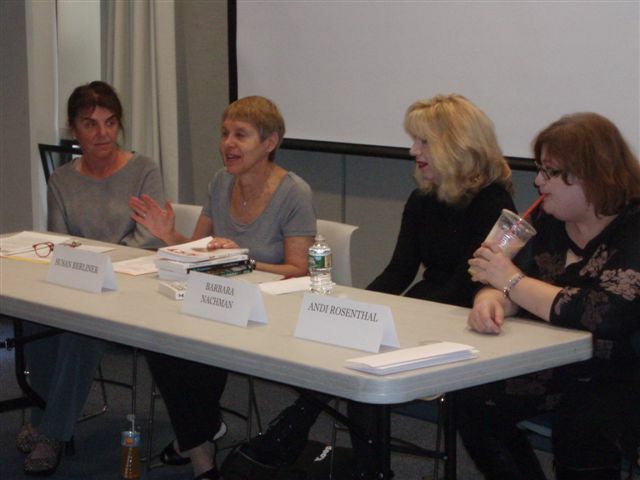 Our Authors' Panel business manager, Barbara McMullen, expertly handles our book sales. Another DUST reader! I just signed this woman's book. As usual, I am talking about DUST. Poet John F. McMullen discusses his writing. Author Don Wortzman describes his experience writing and publishing his thriller. I think the audience enjoyed our talk, but I know they were looking forward to lunch, which was served immediately after we finished speaking. After signing this man's book, I discovered that I once worked with his ex-wife. This couple was interested in the book--and the bookmark. Notice the photo on the back cover of the paperback book this man is holding. It's Stephen King. I knew he would be a potential DUST reader! Both of these women were intrigued with DUST. This was my last customer. As you can see, we were all very happy! Setting up for the Mahopac Library talk. A view of the long table. Signing a copy of DUST. The article below is from The Putnam Examiner. 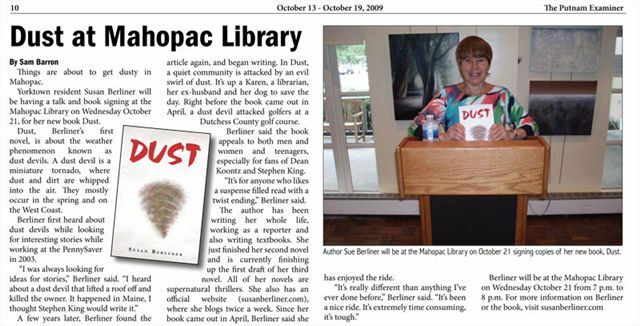 It focuses on my inspiration for DUST and on my October 21 talk at the Mahopac Library. I love the first line! At the podium just before the Hart Library event. Another view of the audience at the library. After the talk, I signed a copy of DUST for this mother and daughter. 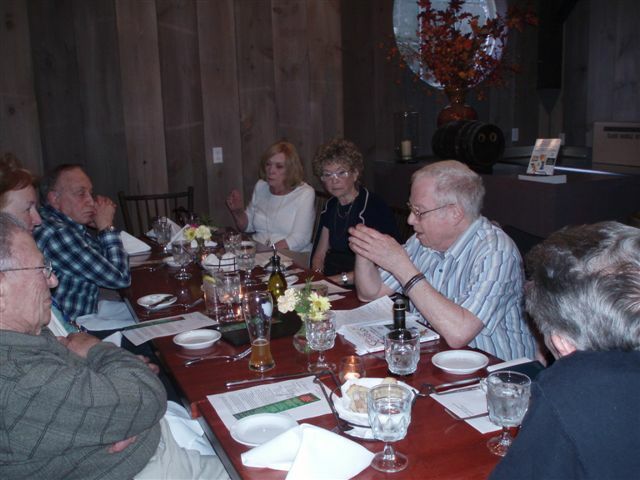 At Lola's Tea House (l. to r. from rear): Authors George Hopkins, John McMullen, Don Wortzman, and me, speaking. I guess I had a lot to say! Maybe all that talking tired me out. I couldn't seem to keep my eyes open after I had just signed this man's book! I'm signing a copy of DUST. Note the "Dust" Basket on the left. It was won by Gene Ehrens of Yorktown. DUST is suitable for all ages. Mom purchased the book for her daughter.